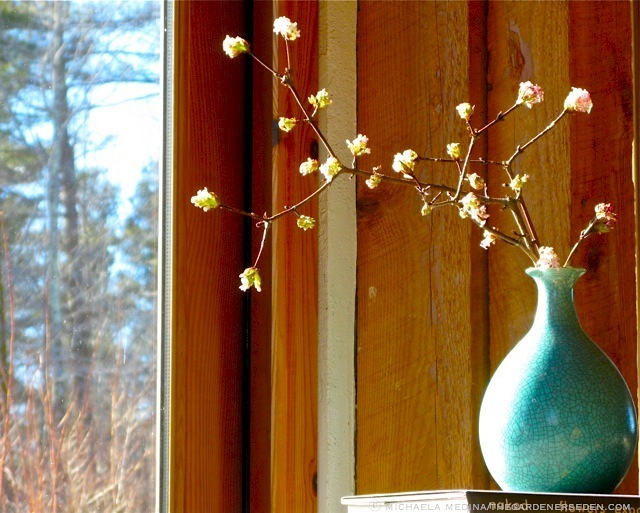 March, much like November, is a different month every year in New England. 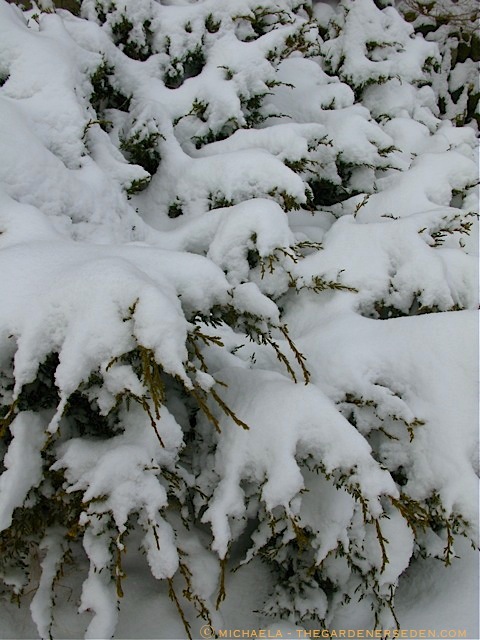 Some seasons, March skies are grey and late winter winds are cold; heavy snow falling long past the vernal equinox. 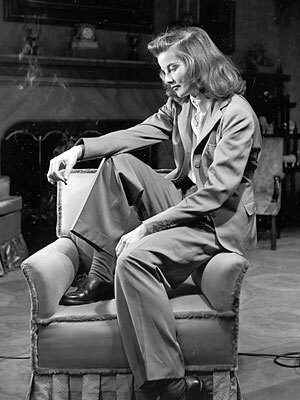 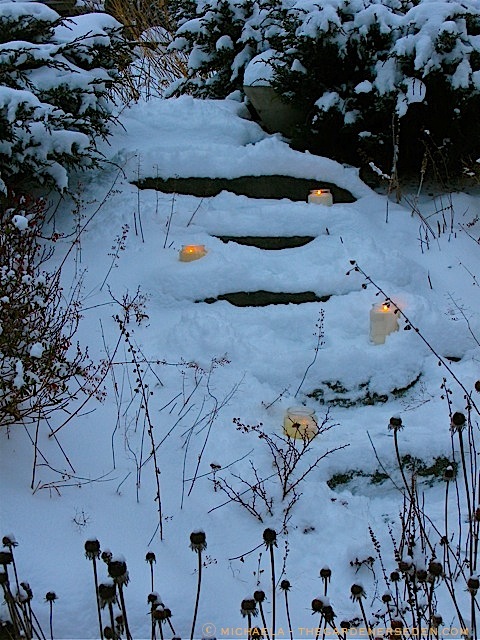 And then there are years when March is soft; weeks of misty skies, melty temperatures and warm sunshine dancing on snow banks as they slowly disappear. 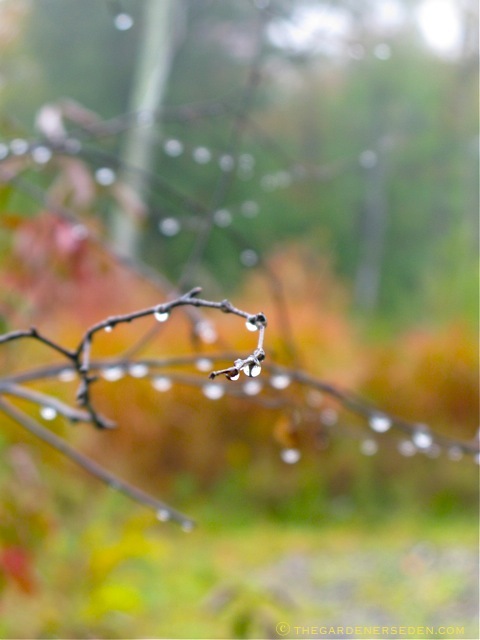 This morning, I awoke to yet another ice storm —a quarter inch glaze coating trees and threatening my electrical supply— and a firm reminder that the chilly season of winter yet reigns. 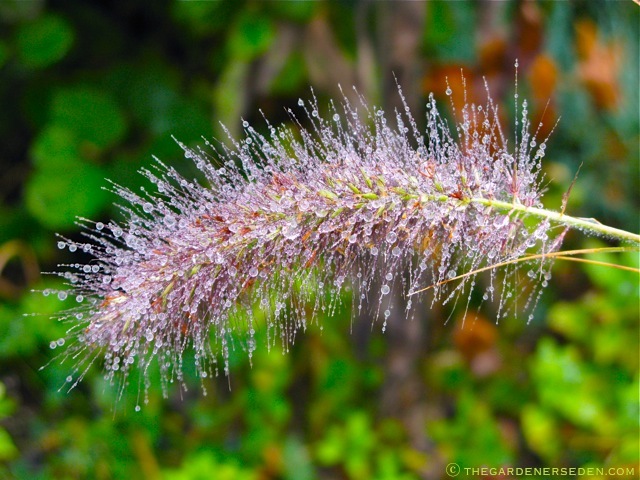 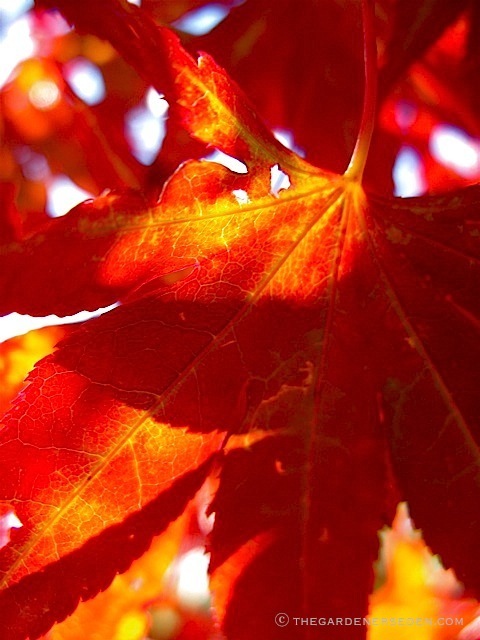 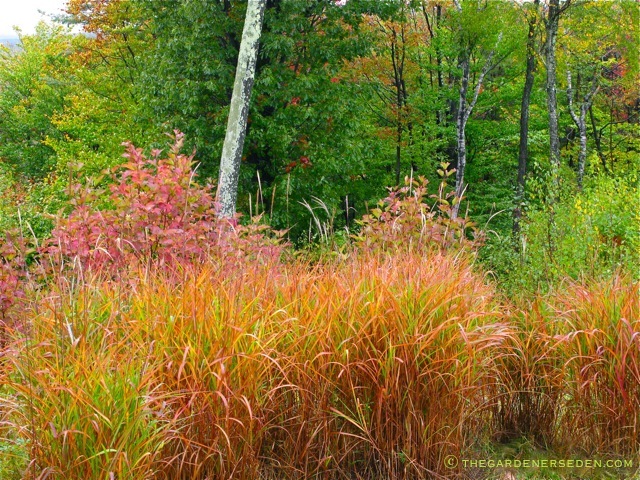 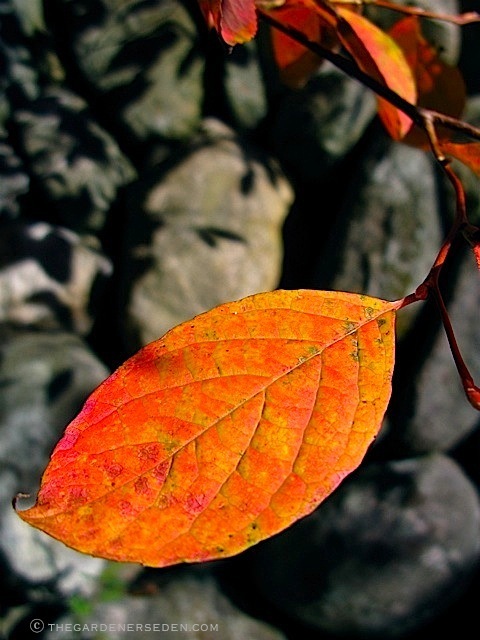 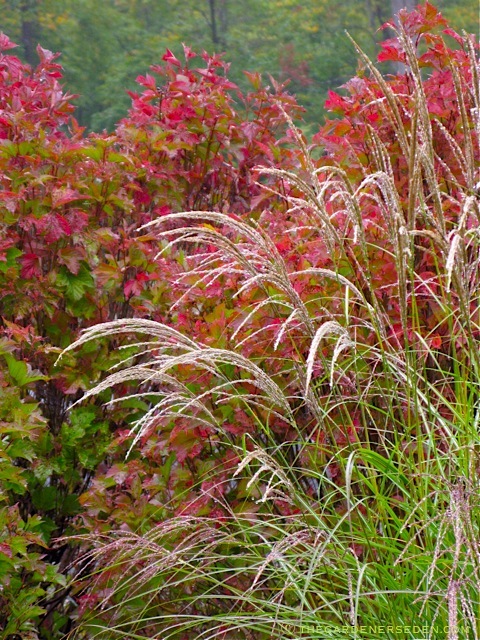 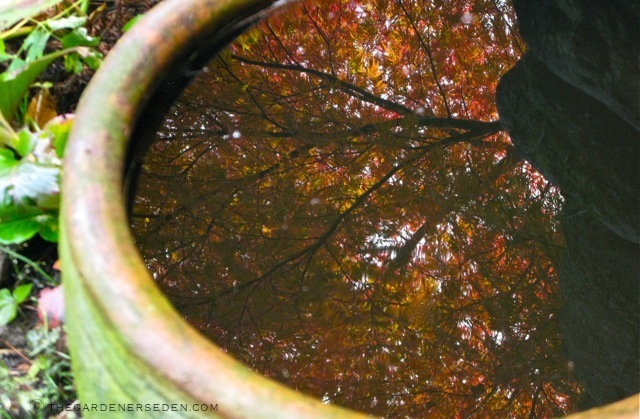 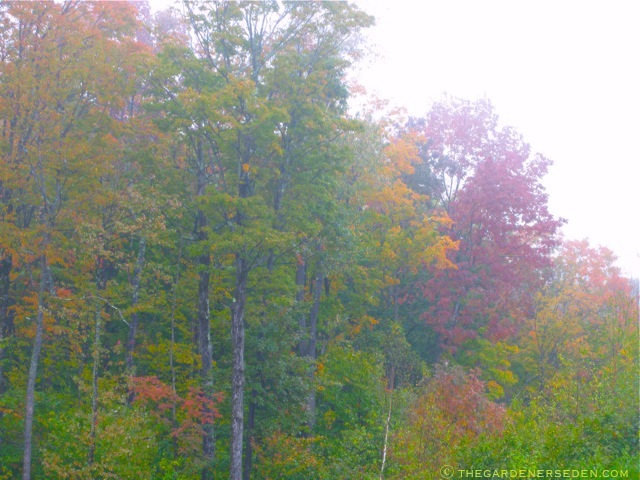 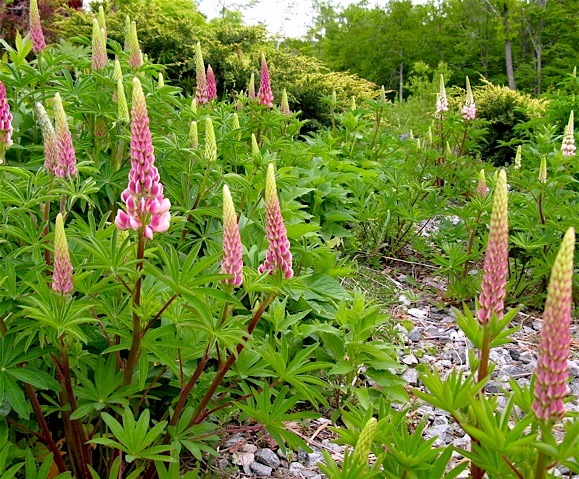 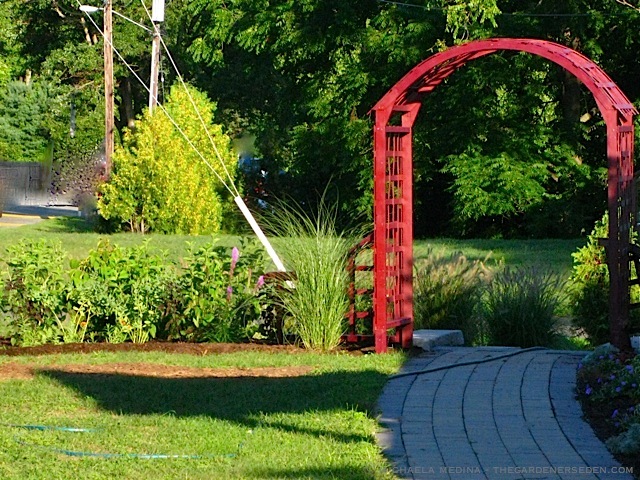 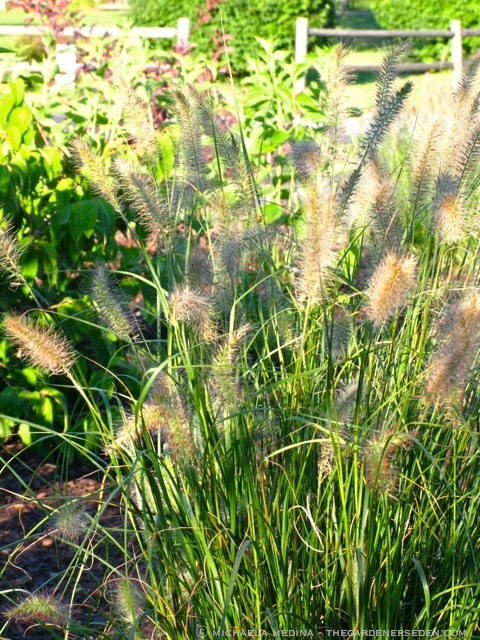 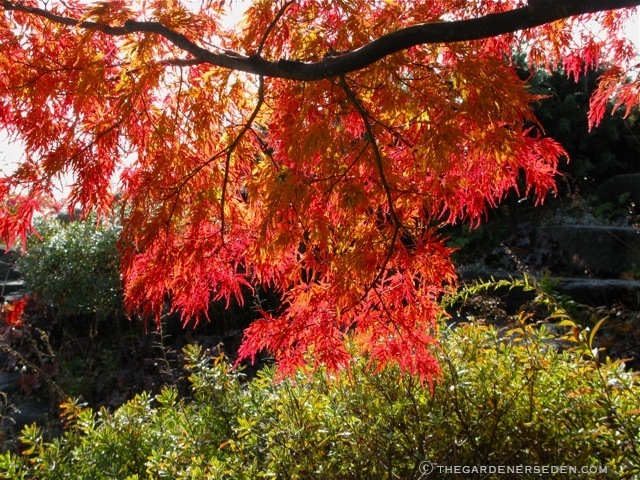 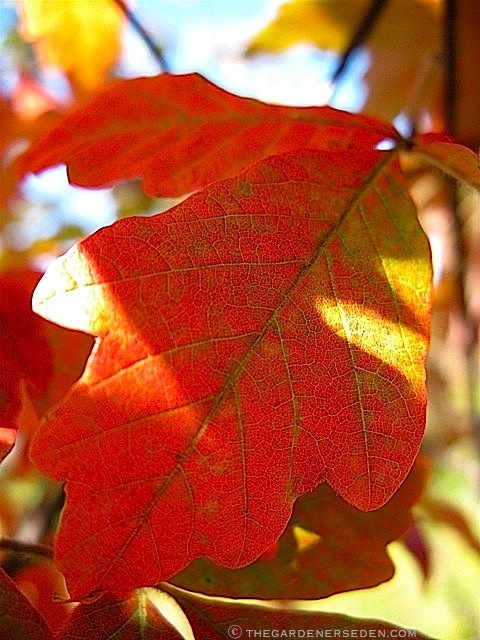 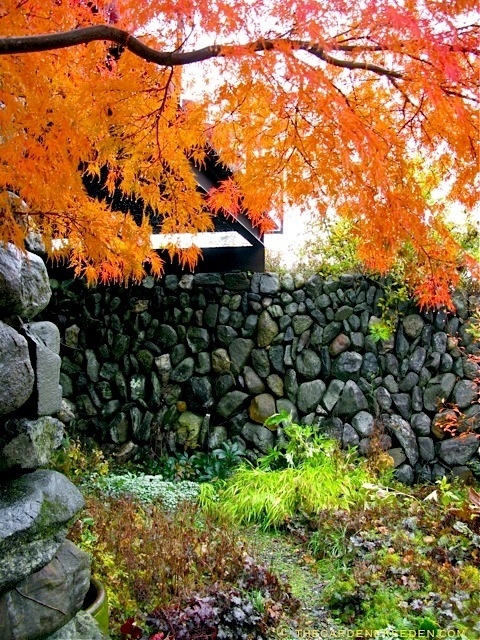 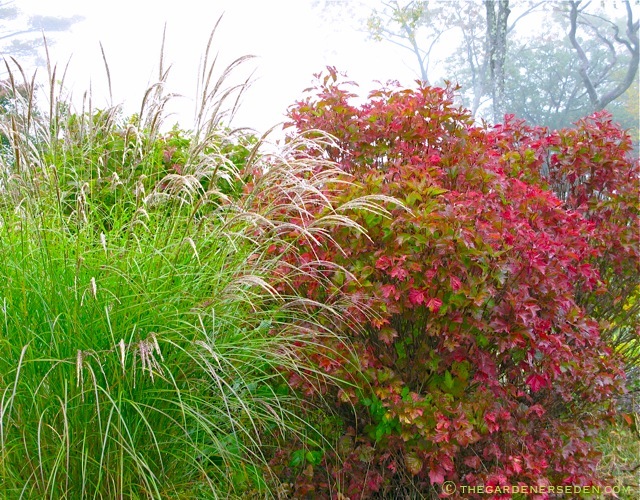 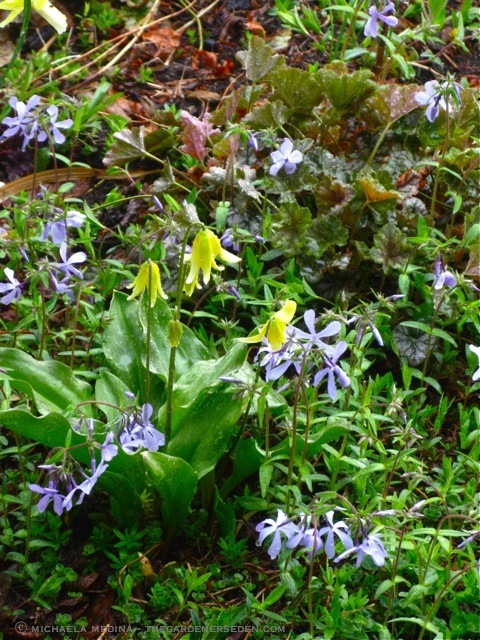 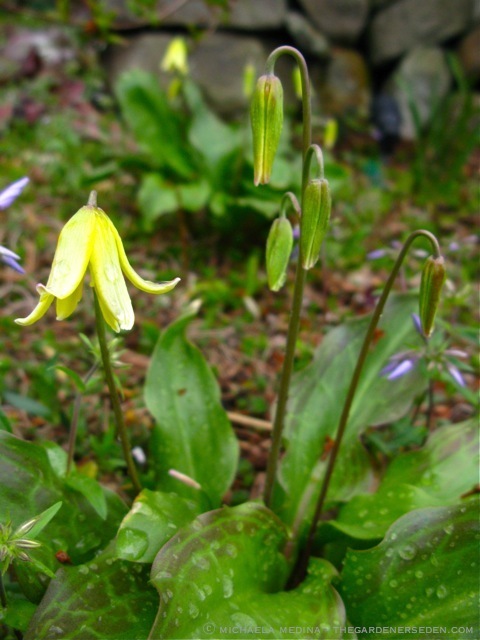 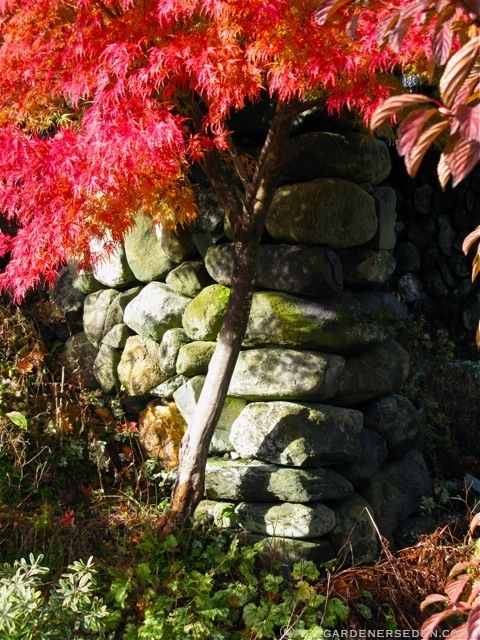 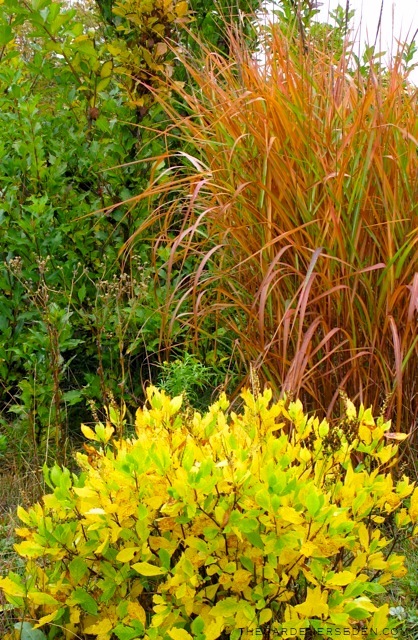 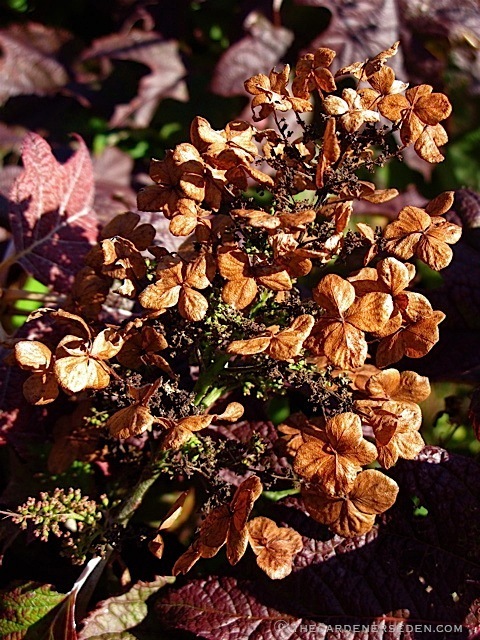 Many of my favorite garden plants have two stellar seasons: spring and fall. 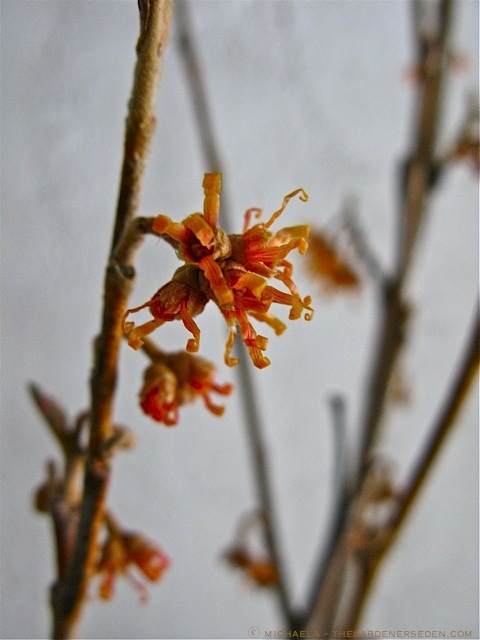 And among my favorites, the family of Hamamelidaceae (the witch hazels) ranks very high indeed. 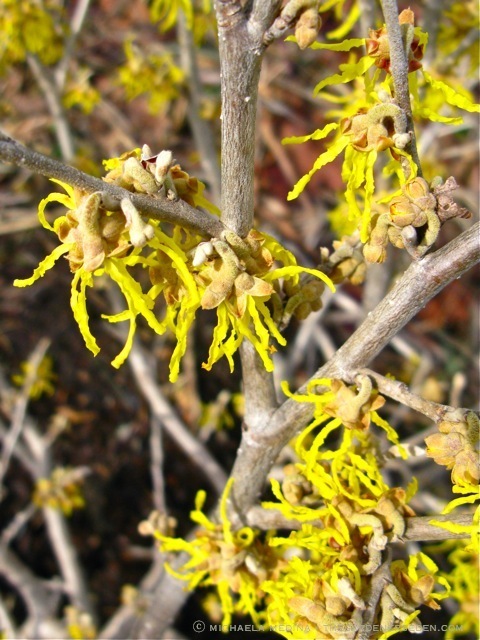 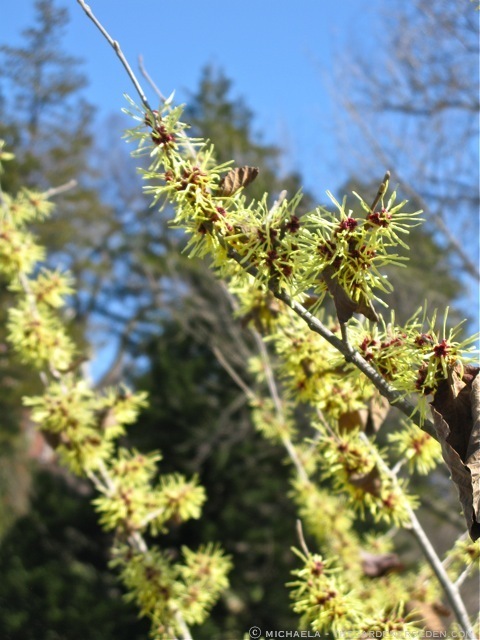 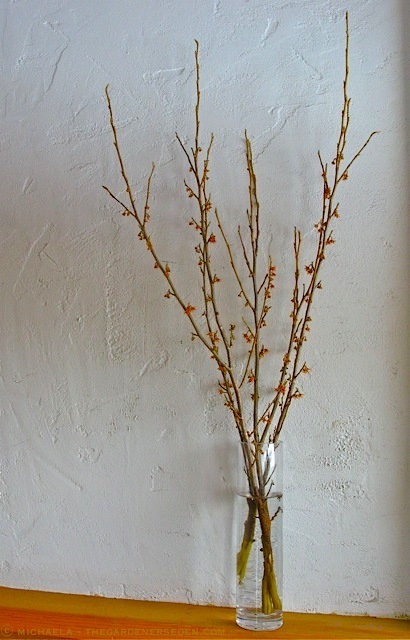 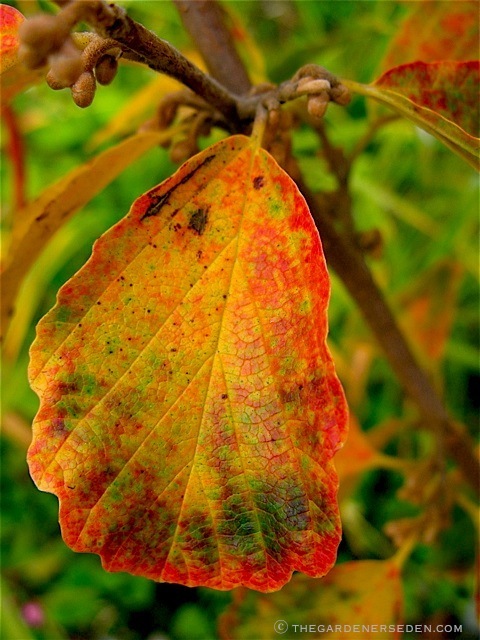 Hamamelis vernalis —sometimes called Ozark or spring witch hazel— is native to the south-central regions of the United States and hardy in USDA zones 4-8. 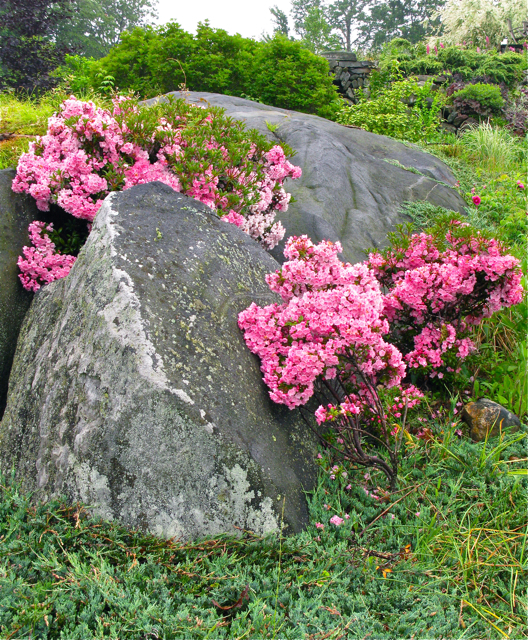 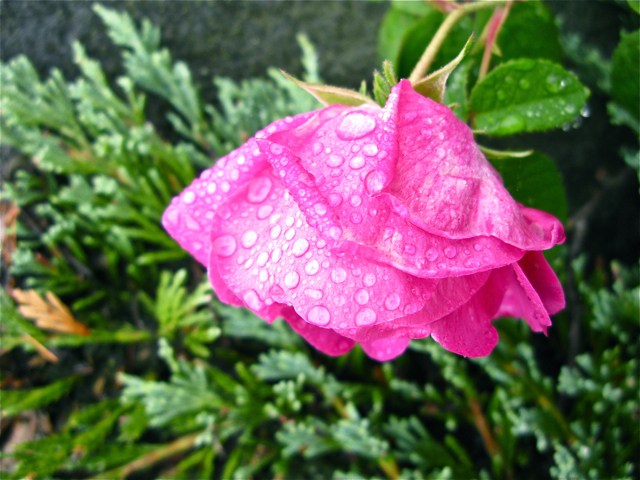 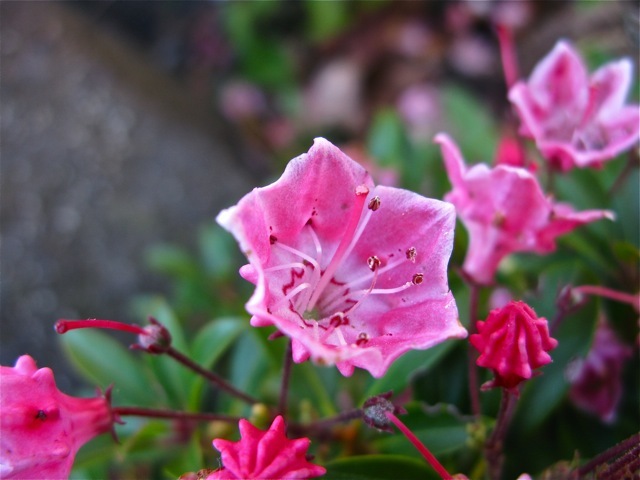 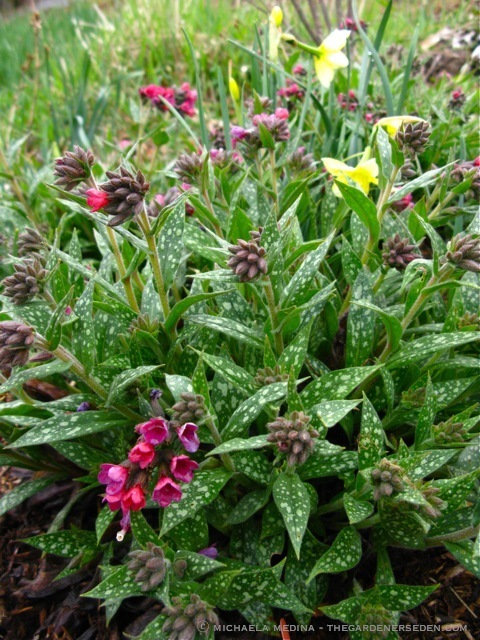 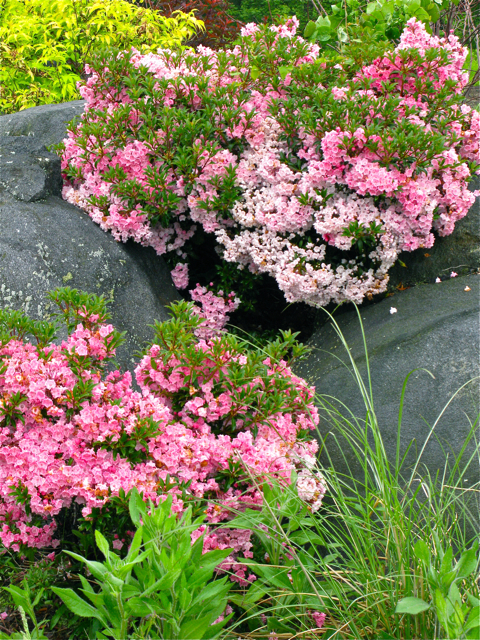 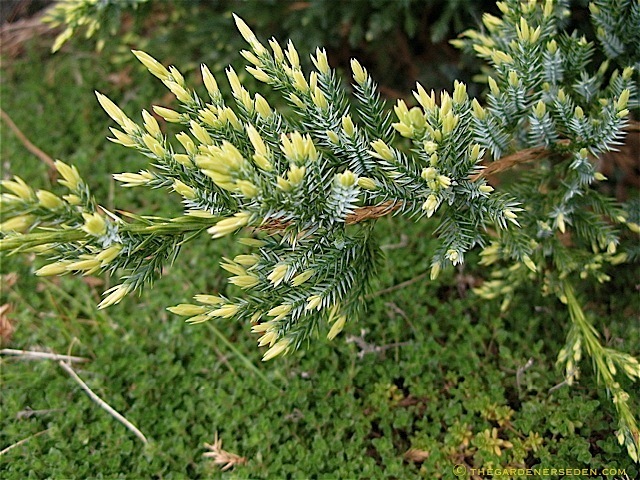 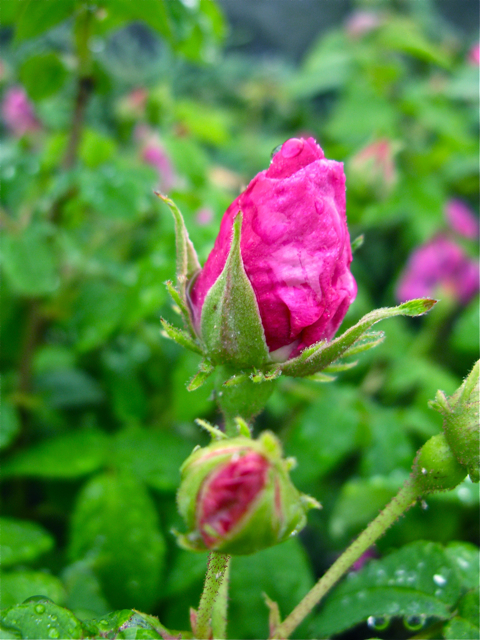 This is a tough, colonizing shrub; tolerant of poor, scrappy soil and a wide range of moisture levels. 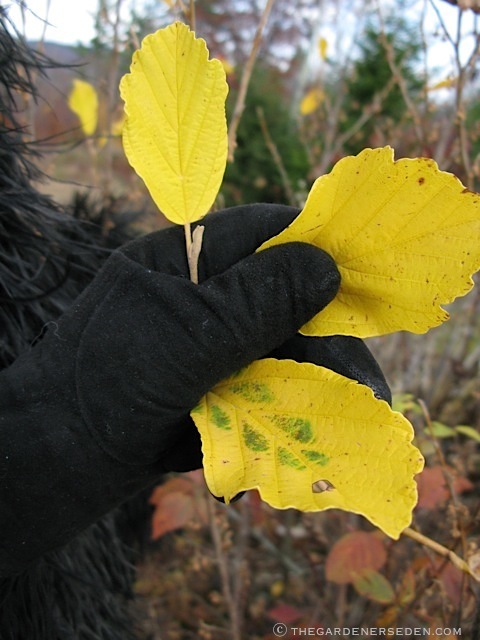 Vernal witch hazel is a great native plant for informal hedging, naturalizing along a woodland boundary or even for something as mundane as stabilizing a steep bank. 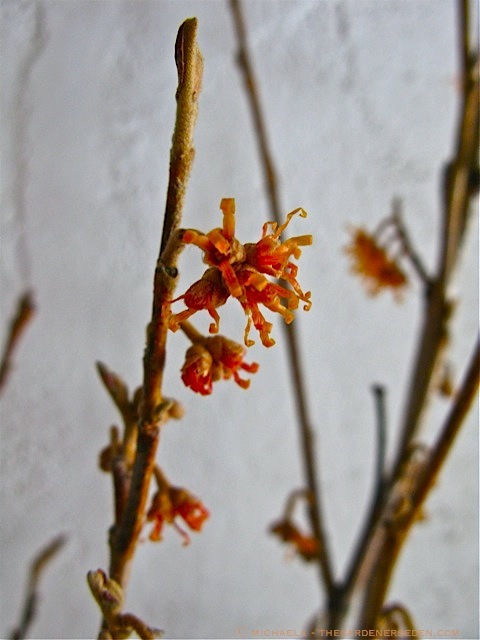 Although her flowers aren’t nearly as large and showy as those of her more flamboyant Asian and hybrid cousins (read my post on Hamamelis x intermedia ‘Diane’ here), the perfume of her early, coppery-orange blossoms is so sweet and delightful that their petite size is easy to overlook. 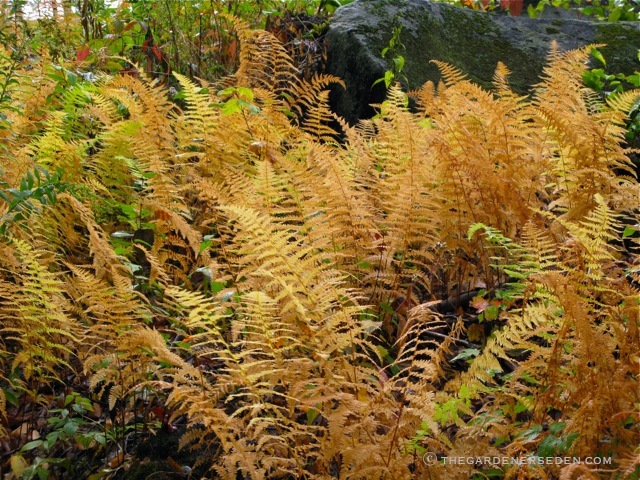 She’s also a glorious sight in autumn, when her softly mounded form turns brilliant gold; shimmering against the blue autumn sky. 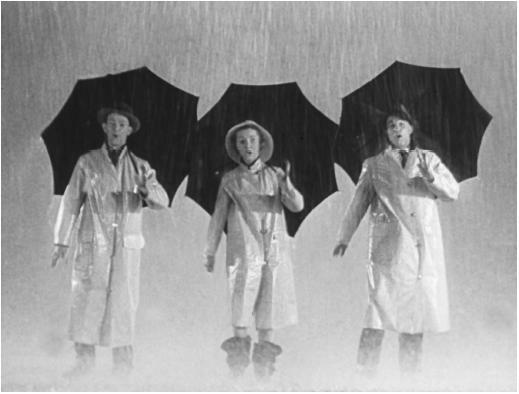 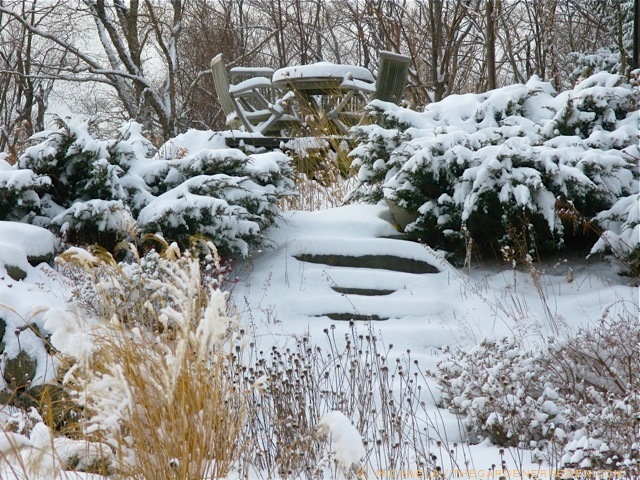 Brr… It sure is cold outside. 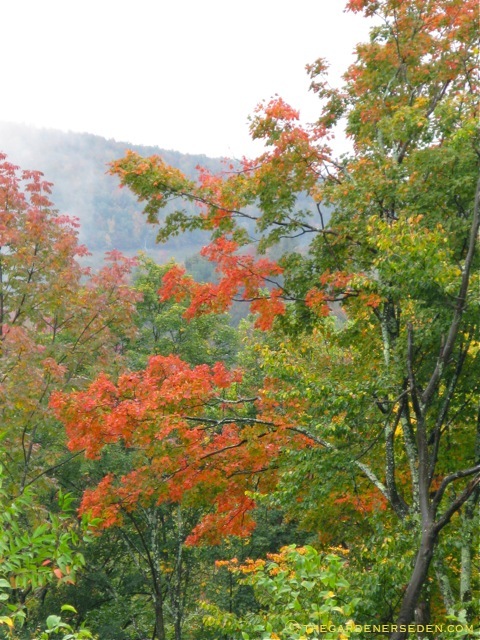 With temperatures hovering around 15 degrees fahrenheit here in Vermont, it takes an awful lot to stop me in my tracks for more than a minute or two. 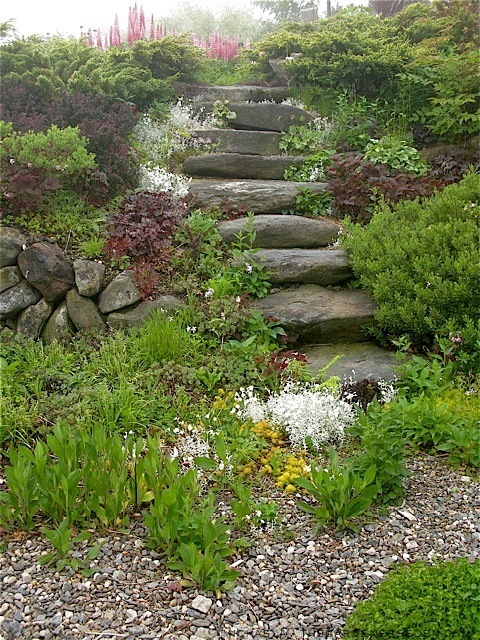 And yet this afternoon, as I walked up the garden path from the driveway, I couldn’t resist lingering outside to enjoy the light and snap a few quick photos to share. 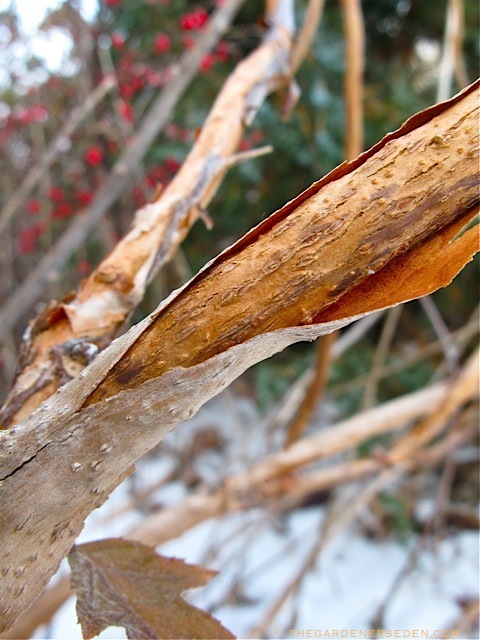 Winter is an incredible time for appreciating the subtler forms of botanical beauty -particularly the colors and textures of twigs and bark. 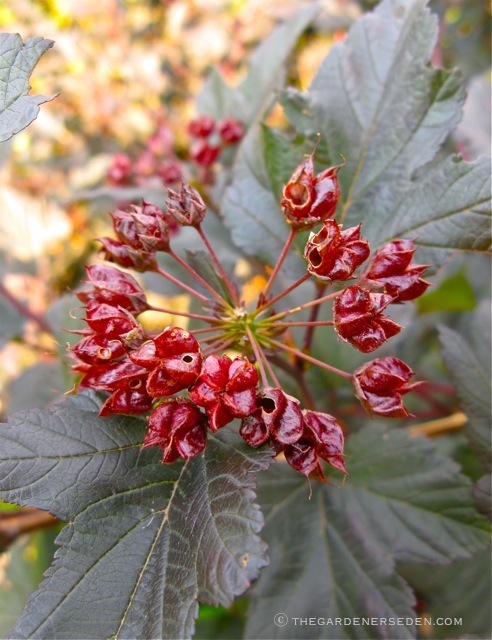 Although most of the trees and shrubs in my garden were chosen for the quality of their form, foliage, flowers and berries, bark always plays a part in my plant selection as well. 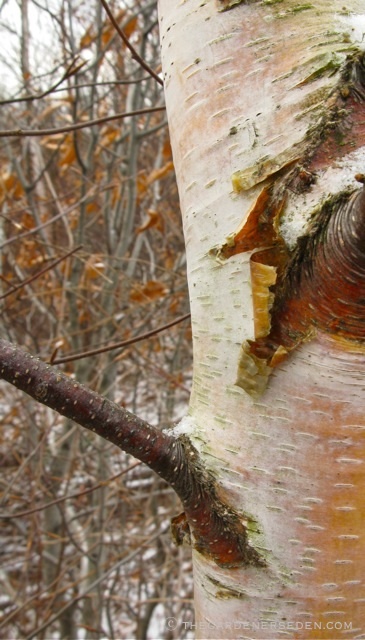 Living in a remote forest-clearing, I’m lucky to be surrounded by woodlands filled with beautiful, native trees –including one of my favorites, the dramatic, white-barked paper birch (Betula papyrifera). 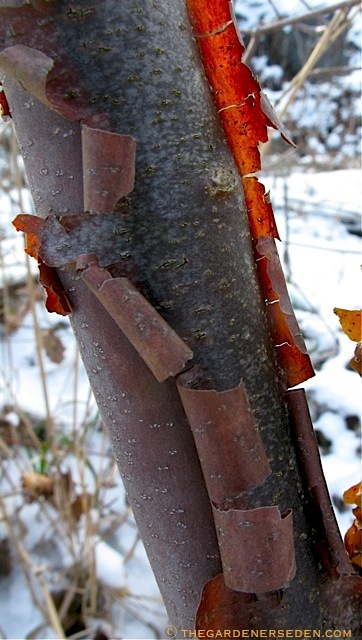 Paper birch trees are gorgeous any time of the year, but in winter, the peachy-cream and cinnamon hues of their peeling bark really stand out against dark hillsides and brown tones in the landscape. 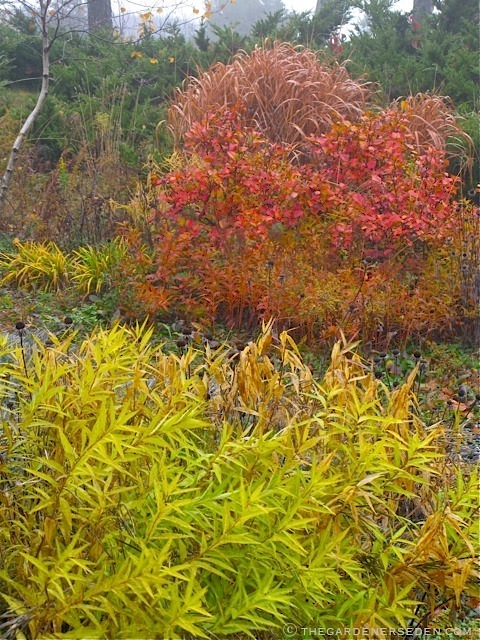 The trunks of other native trees, including the common striped maple (Acer pensylvanicum) with its snake-like bark, and dramatic shagbark hickory (Carya ovata), also add tremendous beauty to winter’s fine tapestry of hues and textures. 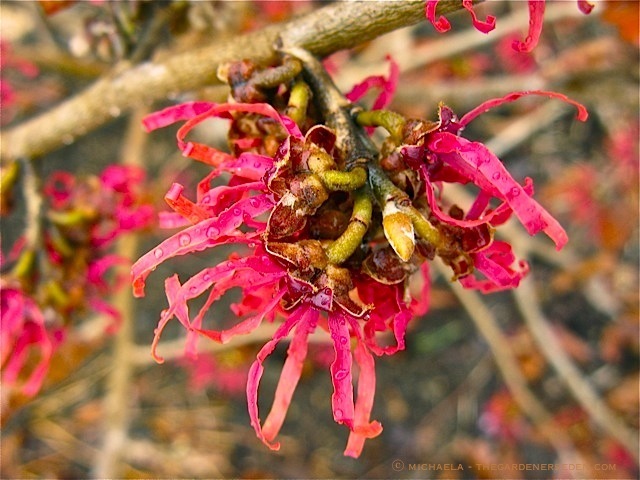 Naked though they may be —stripped of their foliage for nearly six months out of the year— the deciduous trees and shrubs of New England remain a constant source of fascination to my eyes. 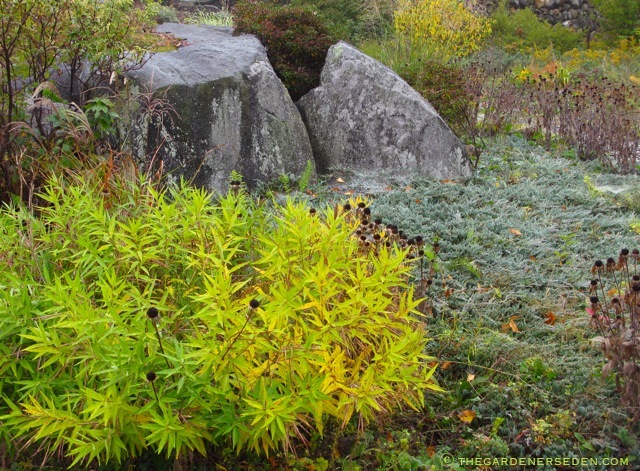 Taking my cue from nature, I’ve added a wide variety of trees and shrubs with peeling, papery, striped and shaggy bark to my garden; adding visual interest throughout the quiet season. 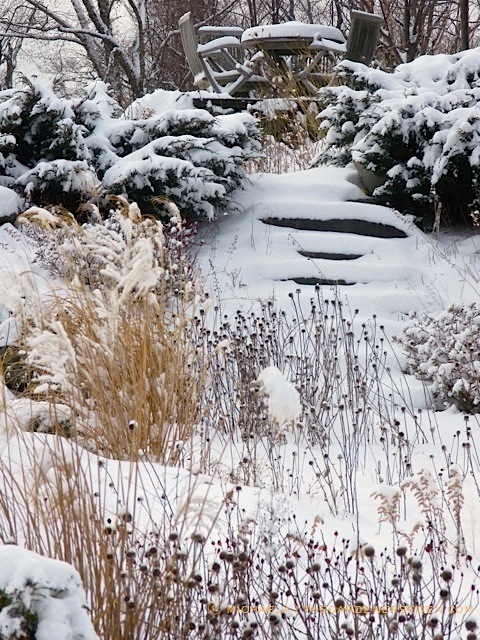 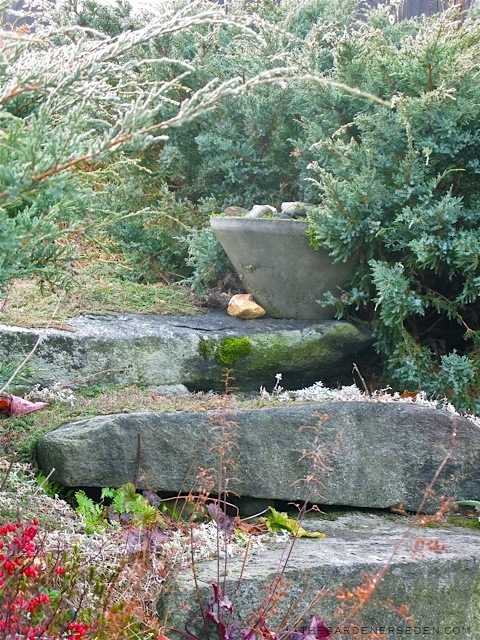 In winter, the surfaces of these textural plants enhance the beauty of outdoor spaces —including beds and borders, paths and walkways— as well as the views from the doors and windows of my house. 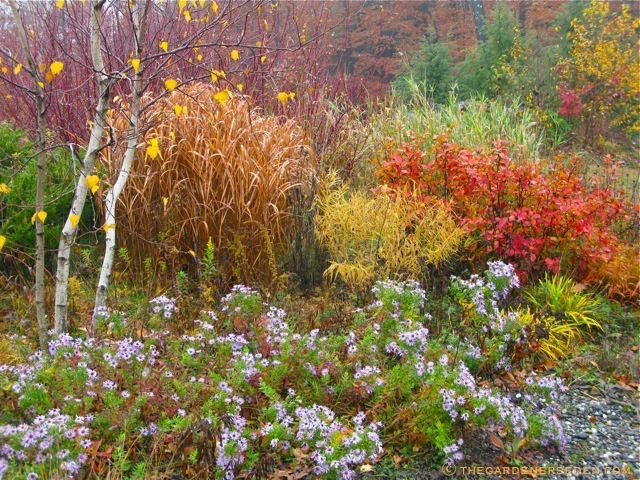 Come December —as snow and ice begin to settle into the nooks an crannies on tree bark, woody stems and twigs— the colors and textures of these plants are intensified; adding to the winter-wonderland surrounding my home. 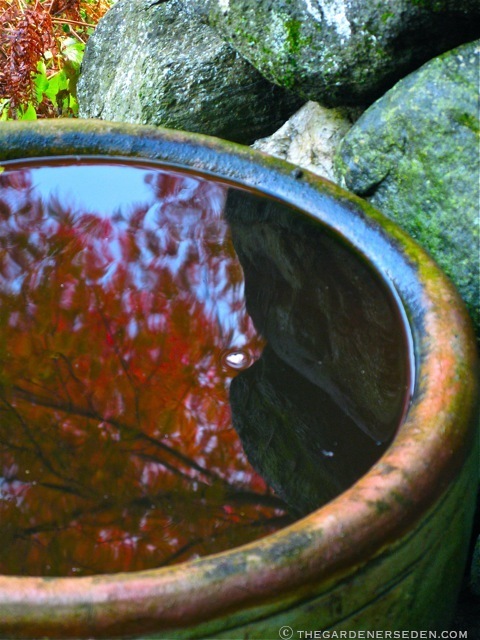 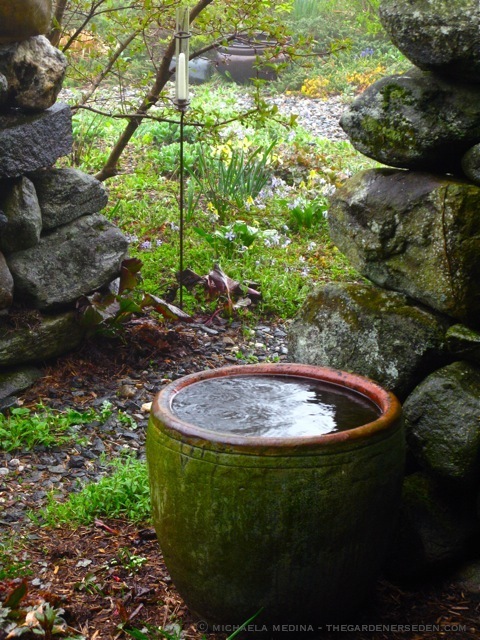 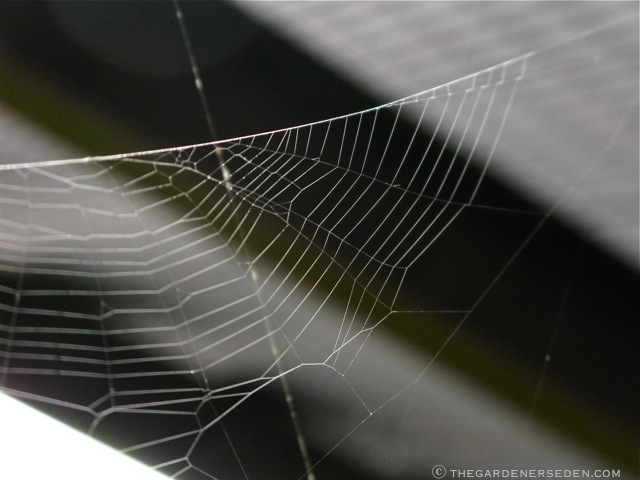 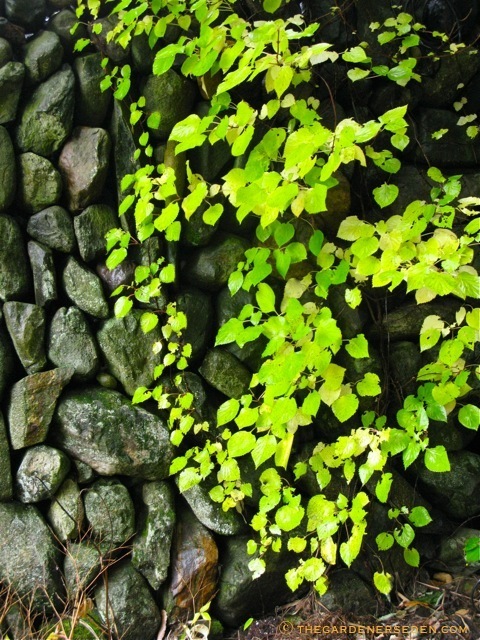 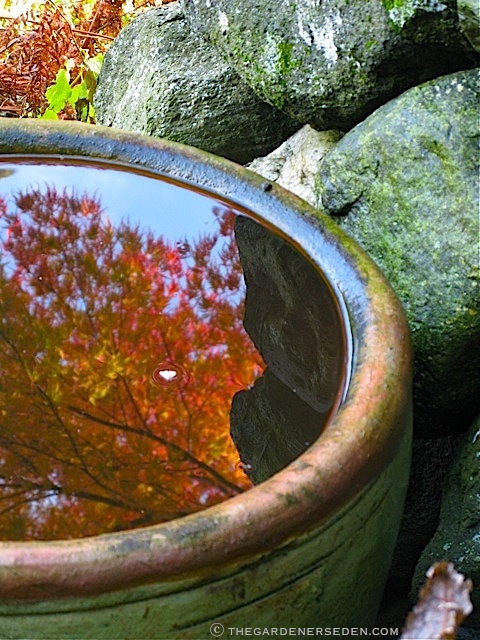 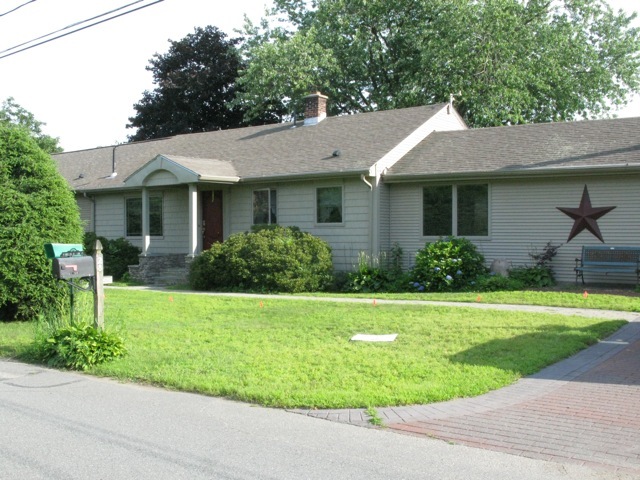 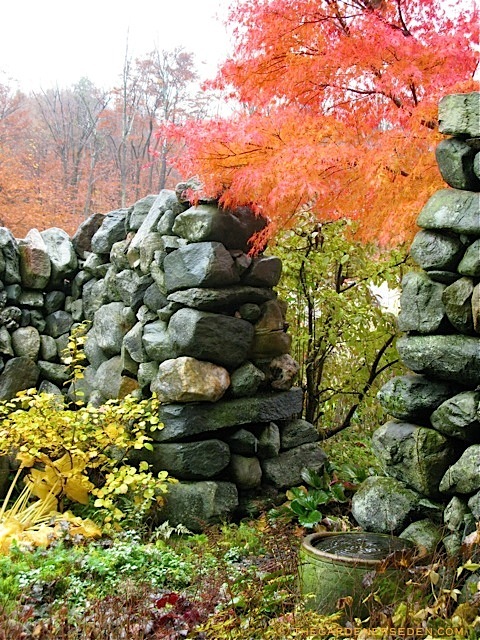 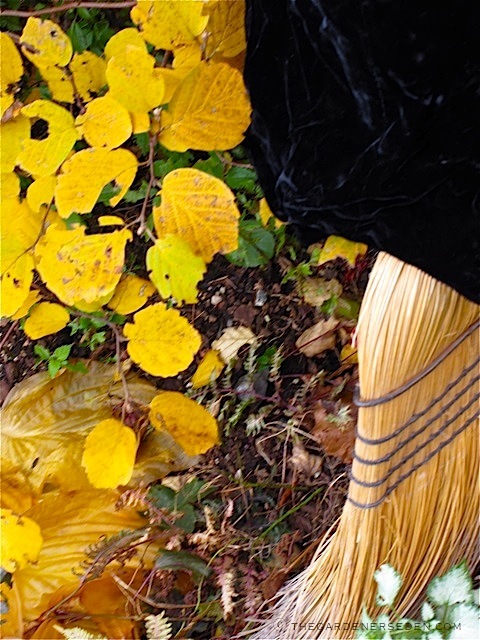 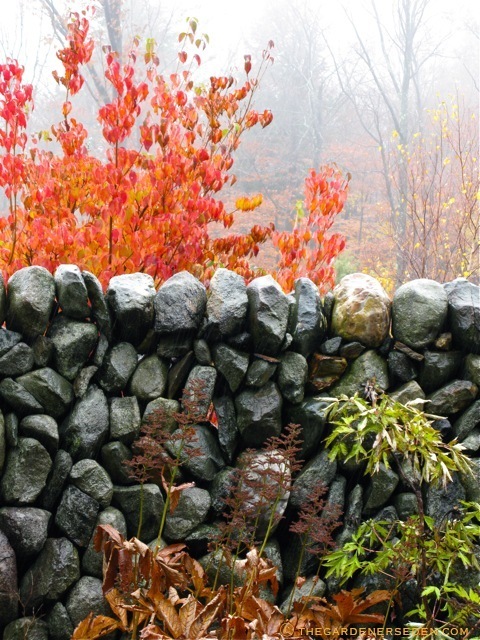 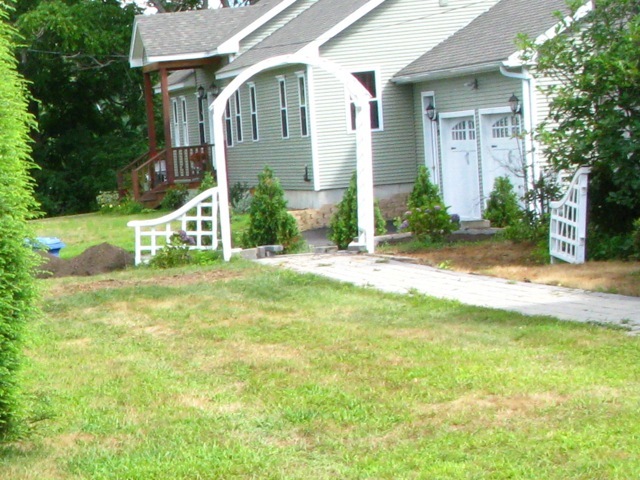 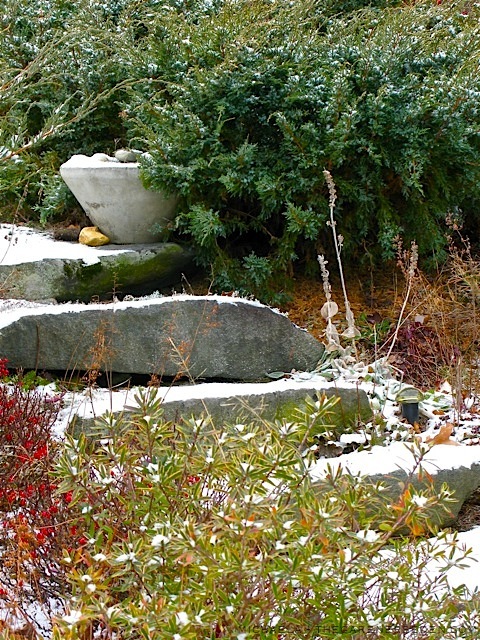 Now is great time to bundle up and make note of the subtle details in your home landscape. 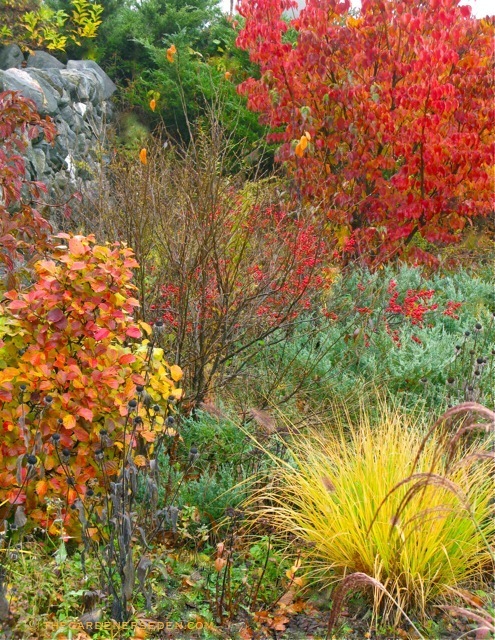 Conifers, as well as the brightly colored twigs and berries of deciduous trees and shrubs add an immense amount of beauty to the winter garden –of course. 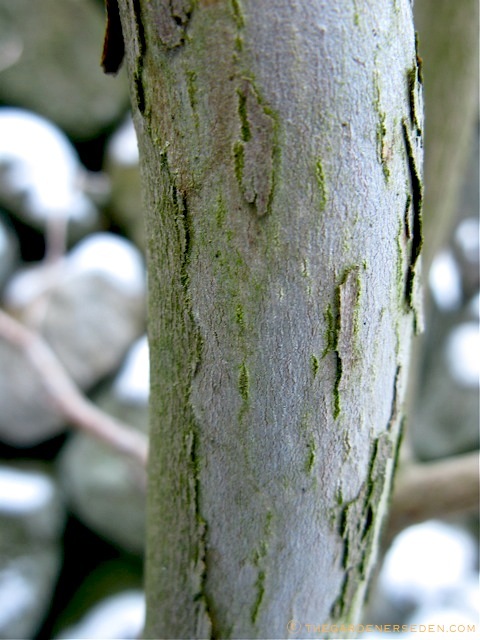 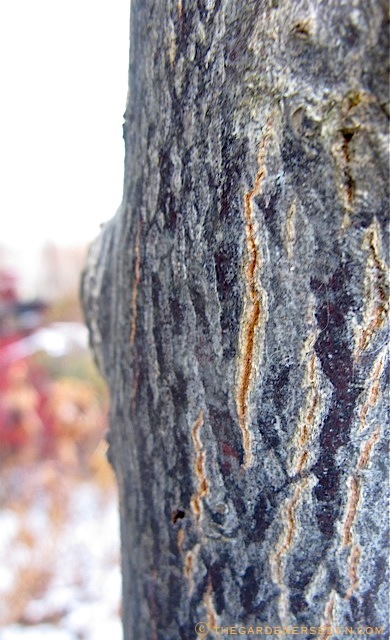 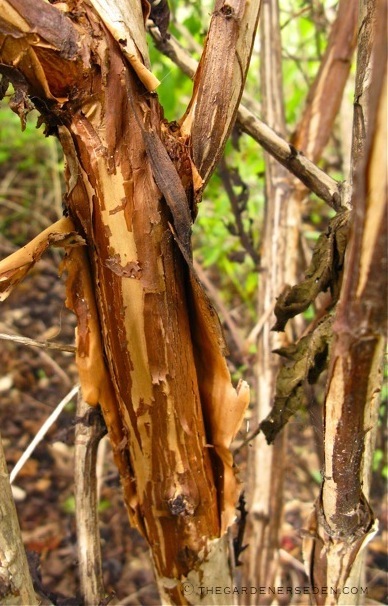 But also, keep the texture of shrub and tree bark in mind as well. 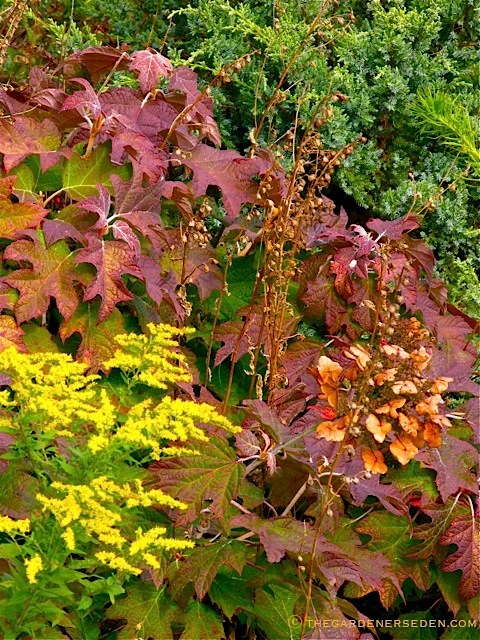 In addition to the specimens pictured here, you may wish to consider Striped Maple cultivars (Acer pensylvanicum cvs. 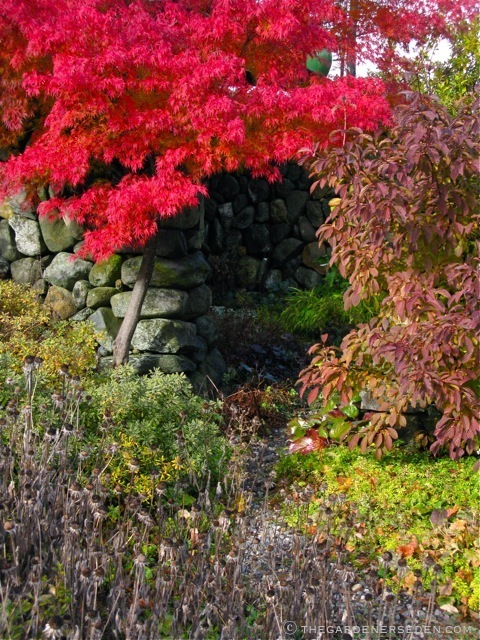 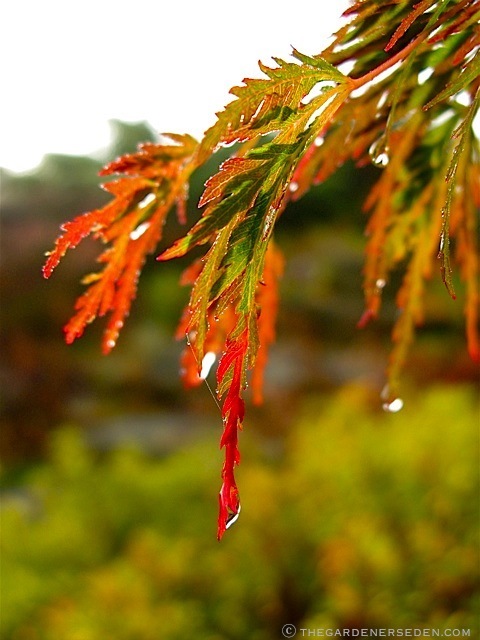 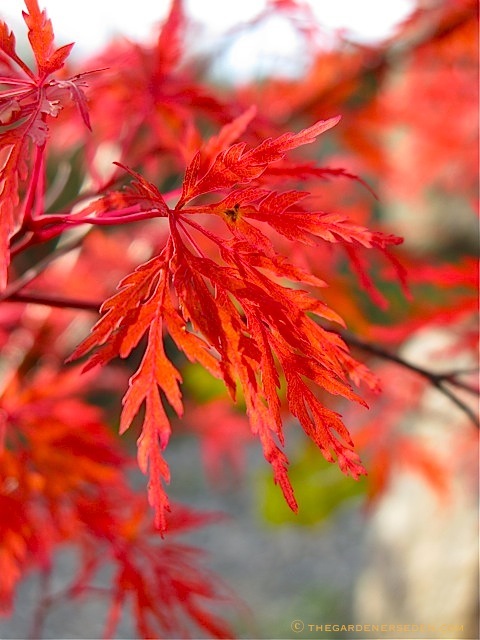 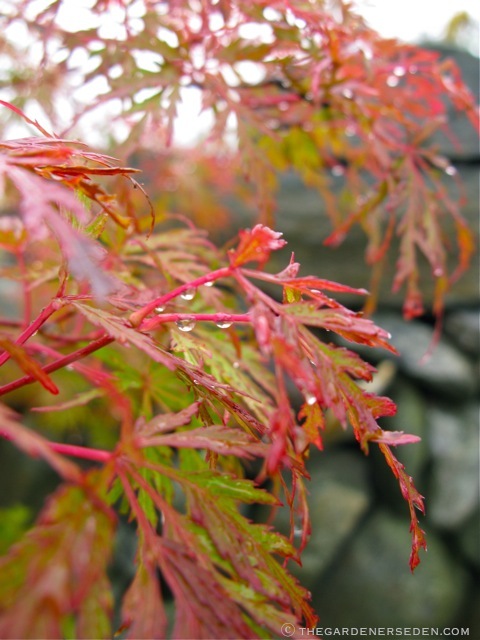 ), Japanese maple (Acer palmatum), River birch (Betula nigra), Katsuratree (Cercidiphyllum japonicum), Cinnamon Clethra (Clethra acuminata), Dogwood species and cultivars (Cornus), Dawn Redwood (Metasequoia glyptostroboides), Black Tupelo (Nyssa sylvatica), Sourwood (Oxydendrum arboreum), and one of my all-time-favorite trees (and recent garden addition) Persian ironwood (Parrotia persica), among other texturally dramatic choices for the garden. 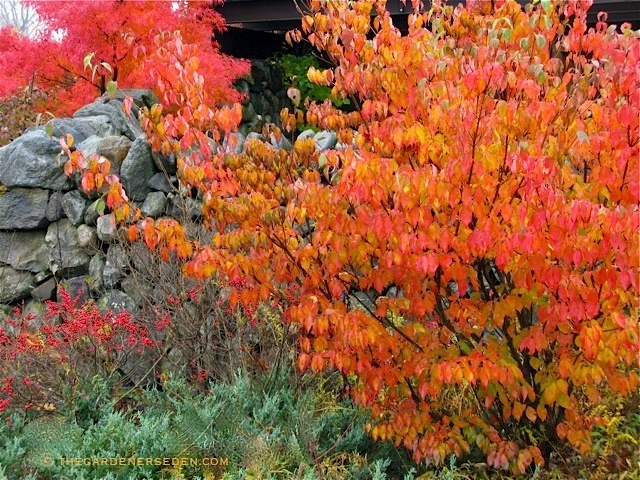 In the last weeks of late autumn —after the leaves have all fallen and deciduous trees stand naked and rattling in cold wind— the conifers and fruit-bearing shrubs reign supreme in my garden. 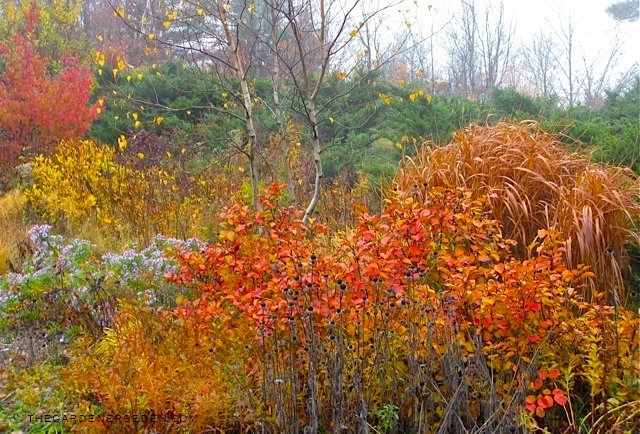 Late fall and early winter days —laced with hoar frost and sugar-coatings of fresh snow— are brightened by the glow of colorful berries, twigs and richly hued conifers. 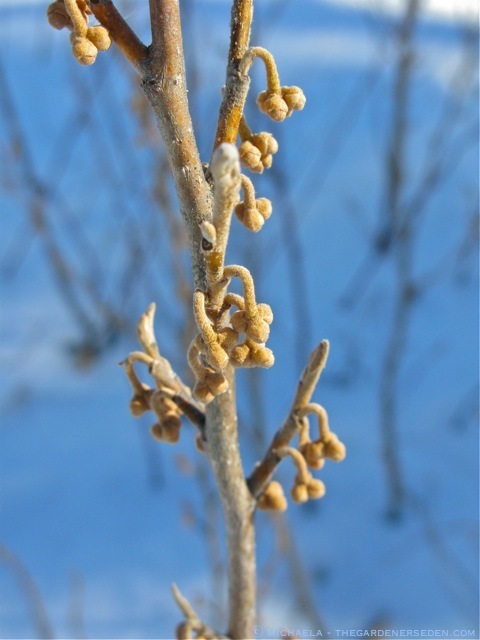 All of the delicately textured remnants —needles, seeds and tiny twigs— catch falling ice crystals and snow flakes; like sweets coated in confectioners sugar. 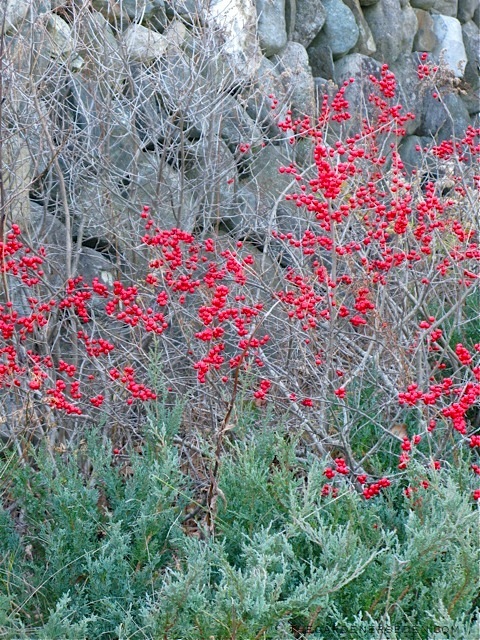 One of my favorite late-season shrubs, the Ilex verticillata ‘Red Sprite’ (common, dwarf winterberry holly) planted in front of my Secret Garden, is a knock-out at this time of year. 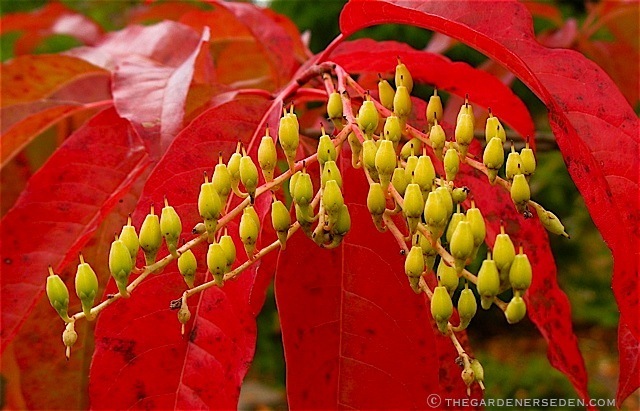 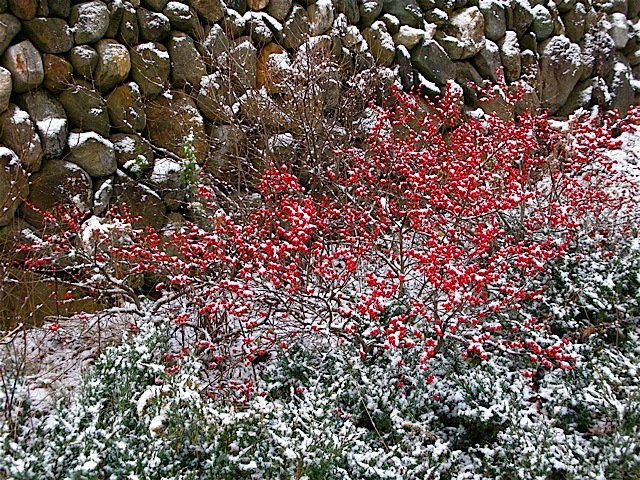 With bright red fruit ripening in September and holding through January or longer, this shrub is invaluable for color in the winter landscape. 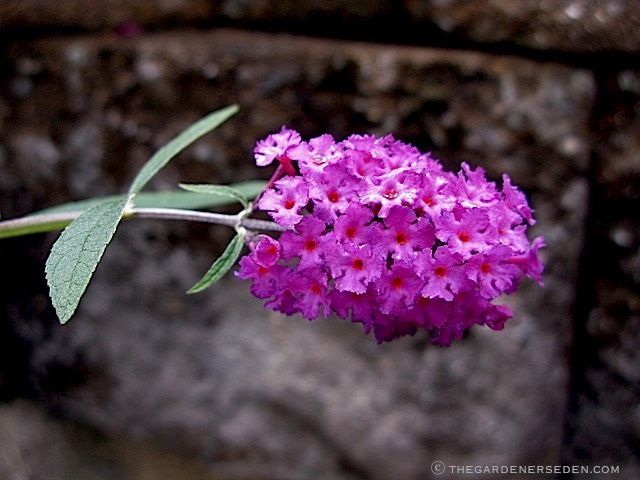 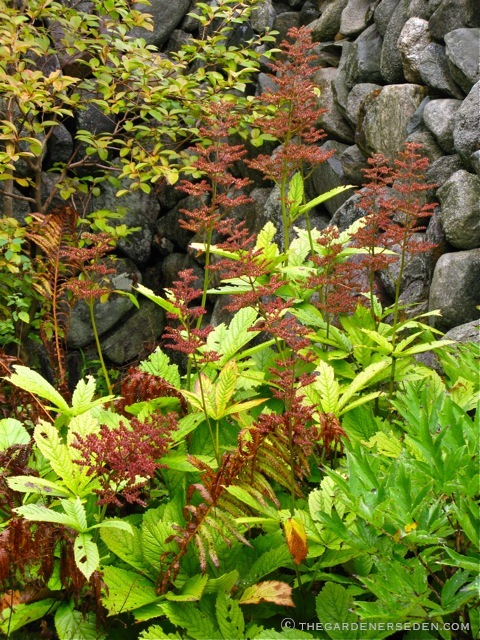 Chosen for its charmingly petite, compact size (about 3-5 feet high and wide) I. verticillata ‘Red Sprite’ is a great choice for softening the edges of walls, buildings and fences. 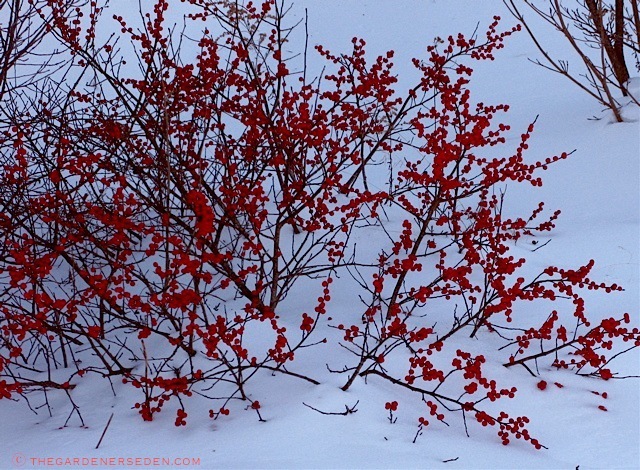 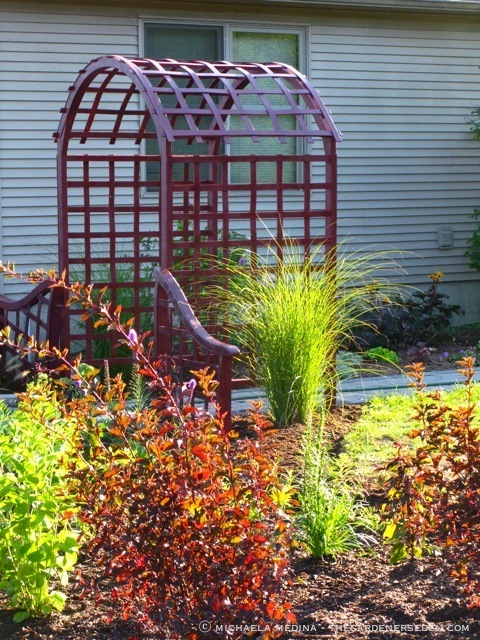 I grow several winterberry cultivars, including the beautiful, statuesque I. verticillata ‘Winter Red’ (9′ x 9′), in my landscape; combining them with conifers and other shrubs and trees to create season-spanning interest in the garden. 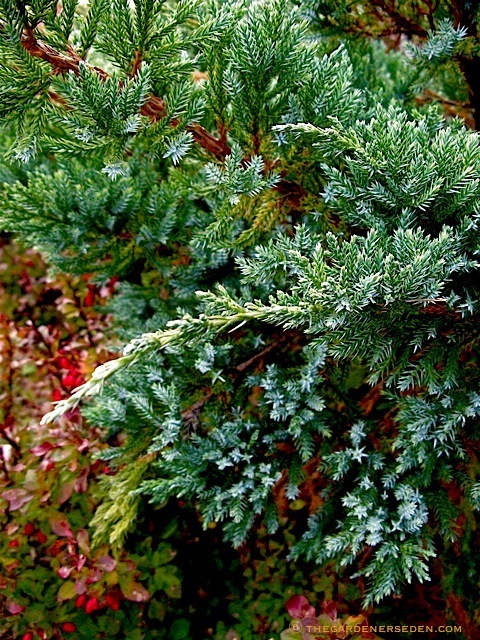 Juniper make great companions for winterberry, and Juniperus chinensis ‘Sargentii’ forms a lovely, contrasting blue-green carpet in front of the dwarf I. verticillata ‘Red Sprite’. 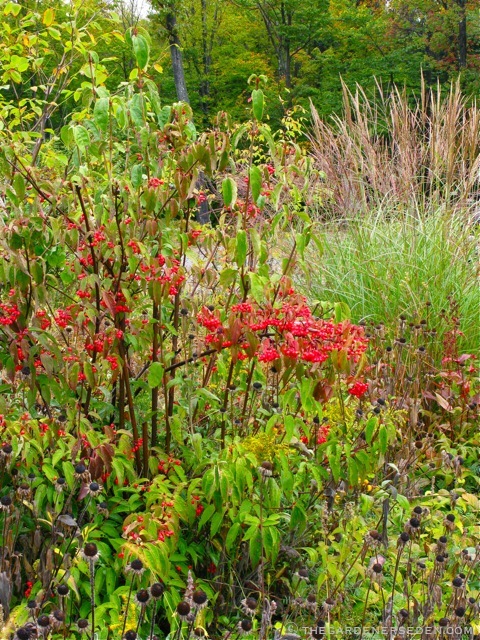 Winterberry are extremely hardy shrubs, (USDA zones 3-9) native to eastern North America. 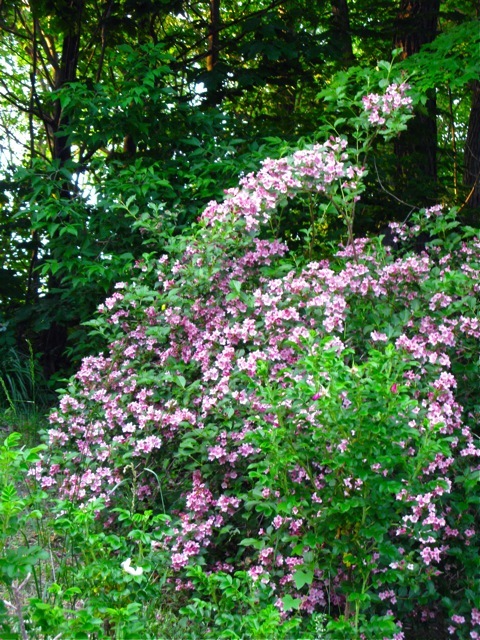 These shrubs are long lived and trouble free; provided they are planted in rich, moist, freely- draining, acidic soil in full sun. 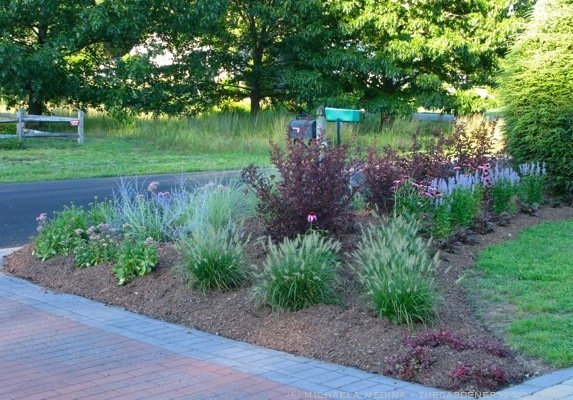 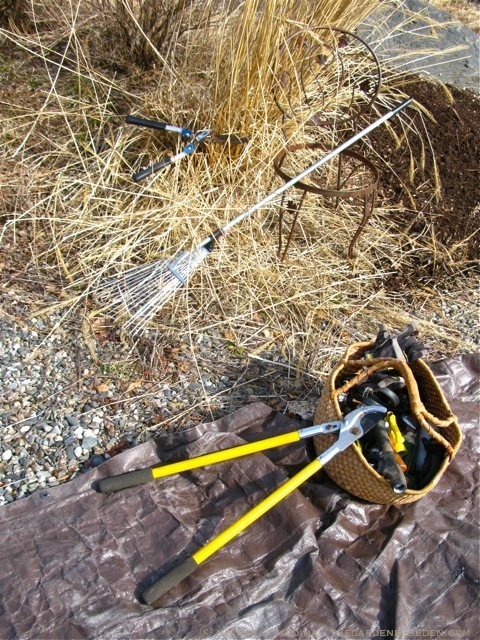 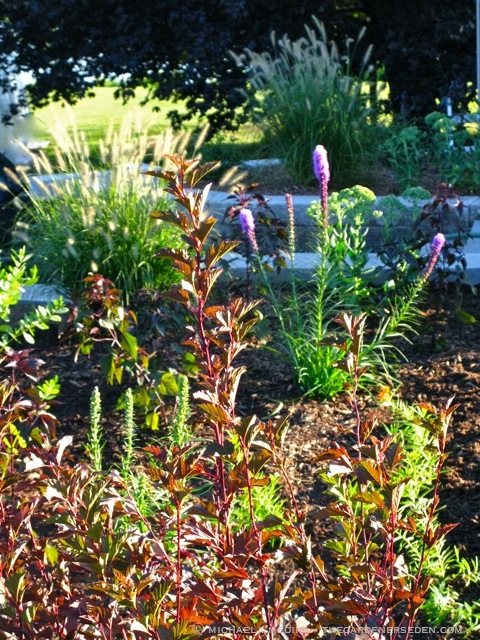 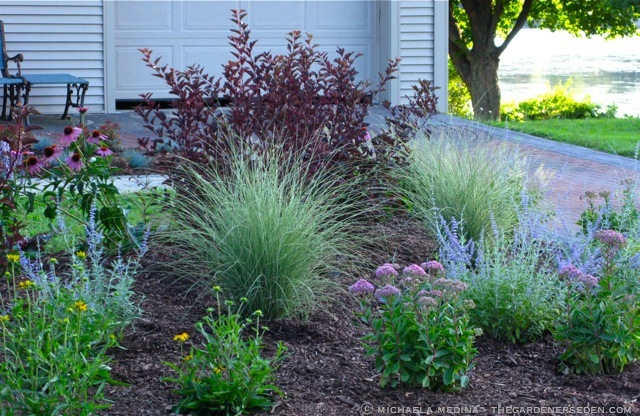 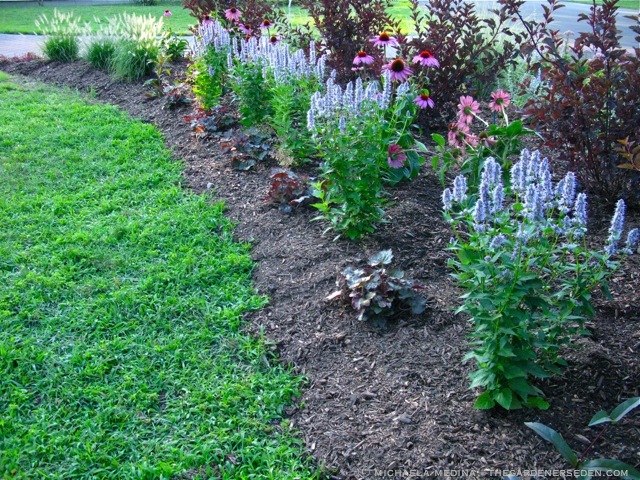 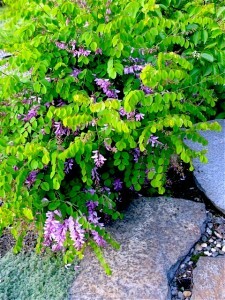 I use a thick, organic mulch to conserve moisture and keep the root zone of my shrubs cool on hot summer days. 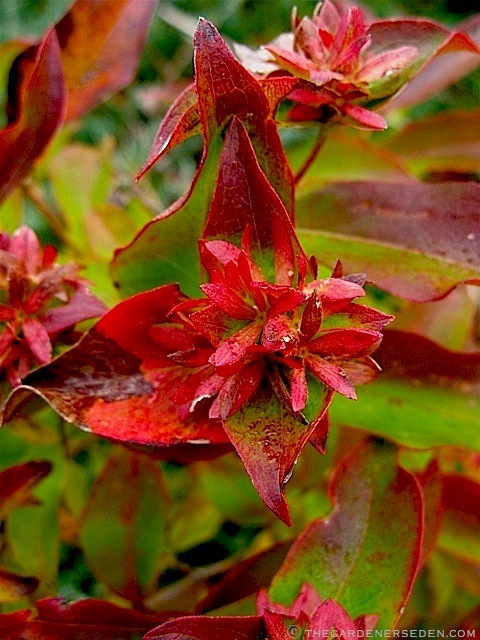 When planting winterberry, it’s important to remember that a male cultivar will be needed for pollination -but only the female plants will bear fruit. 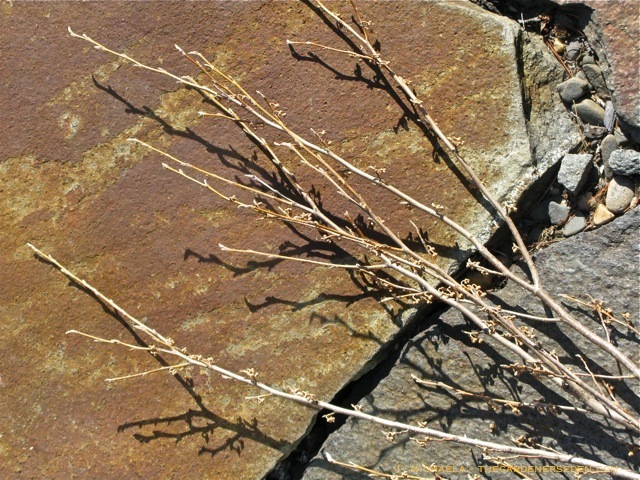 In the grouping pictured below, the bare twigs in the background are the branches of a male cultivar. 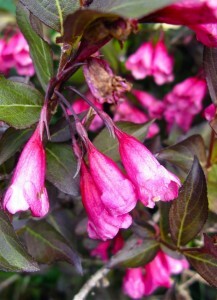 The pollinating shrub needn’t be planted in the same grouping -anywhere nearby will do just fine. 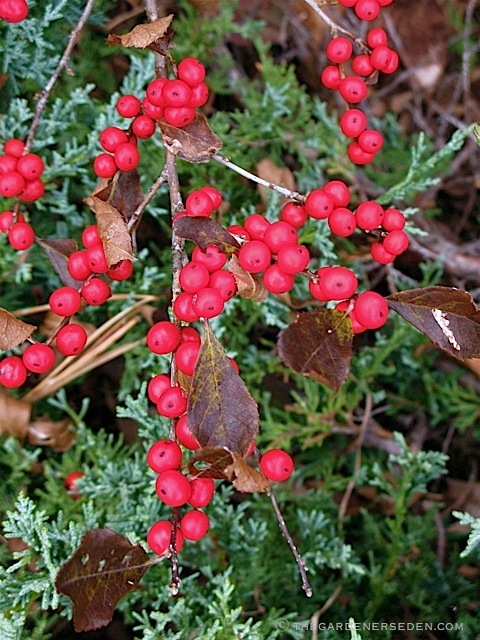 Our native winterberry (Ilex verticillata) can usually be found in wet, low-lying areas —places like marsh and swamp land or natural, open drainage areas— where it forms dense thickets. 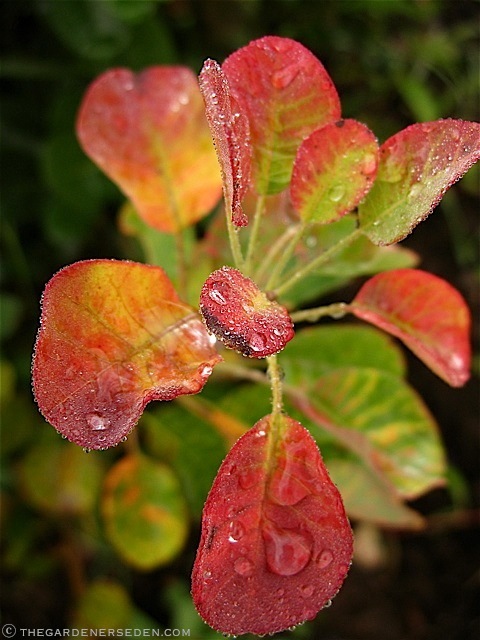 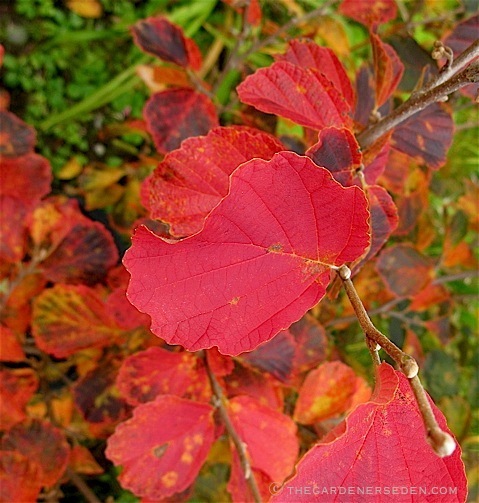 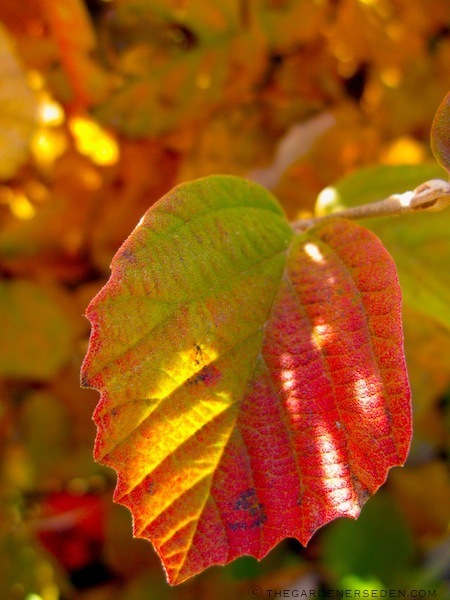 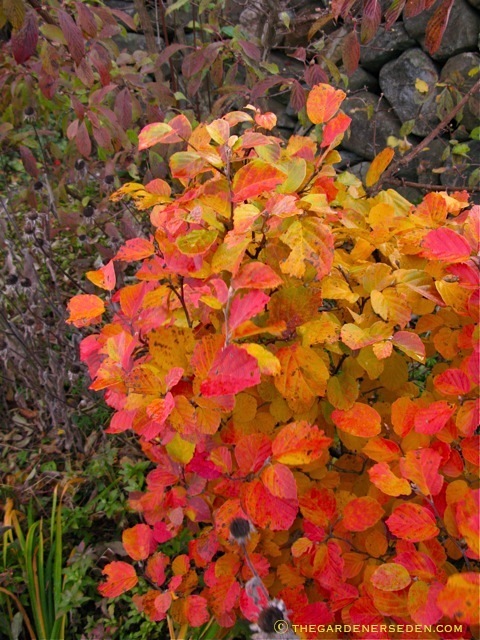 In the later part of the year, the shrubs are filled with colorful, red fruits, which hold until late winter unless they are picked clean by wildlife. 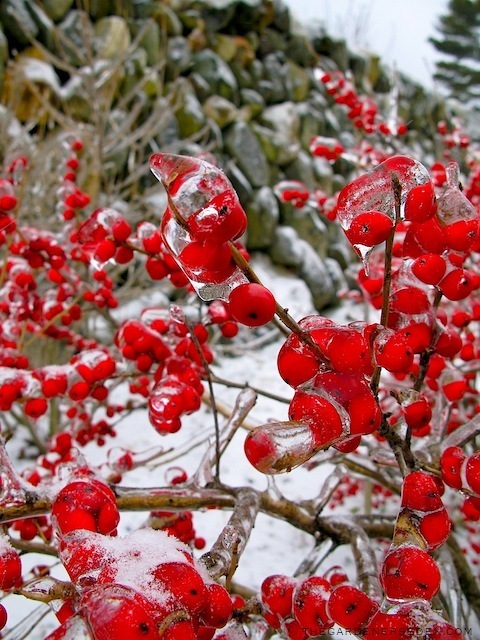 Although winterberries are inedible to humans (mildly toxic) they are extremely popular with small mammals and overwintering birds. 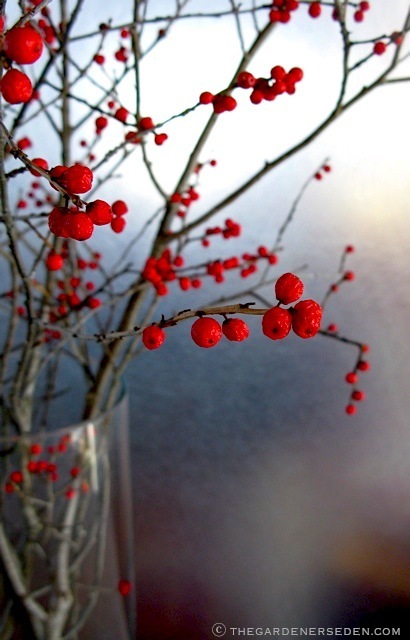 Gathering winterberry for holiday decorations is a tradition for me, as it is for many cold-climate gardeners. 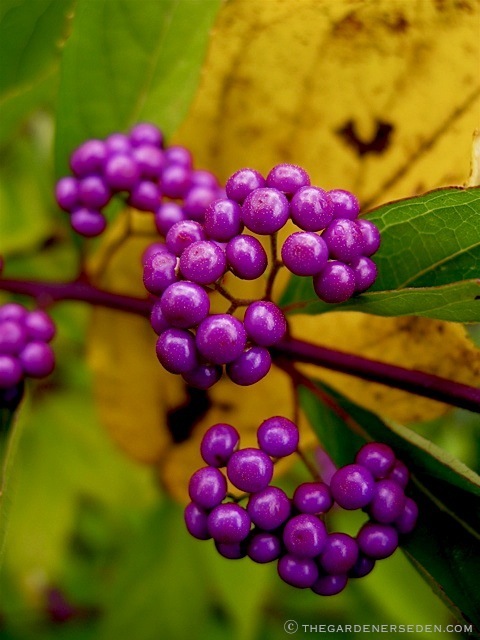 If you are collecting these berries from the wild, please be sure to check with the property owner before harvesting — and never harvest from public parks or protected lands. 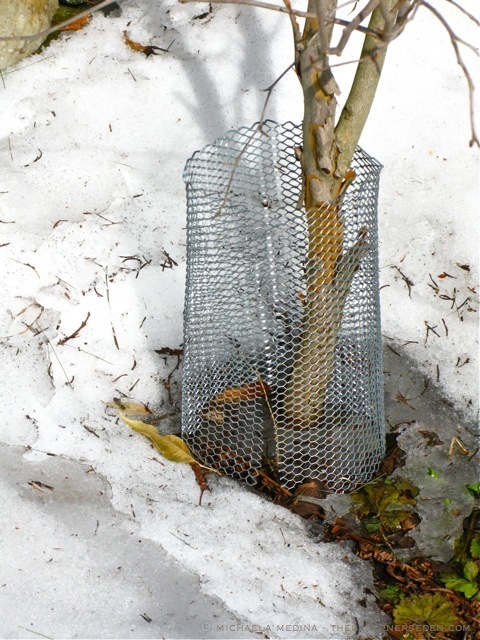 Always gather branches responsibly; leaving enough for the wildlife depending upon this important source of food. 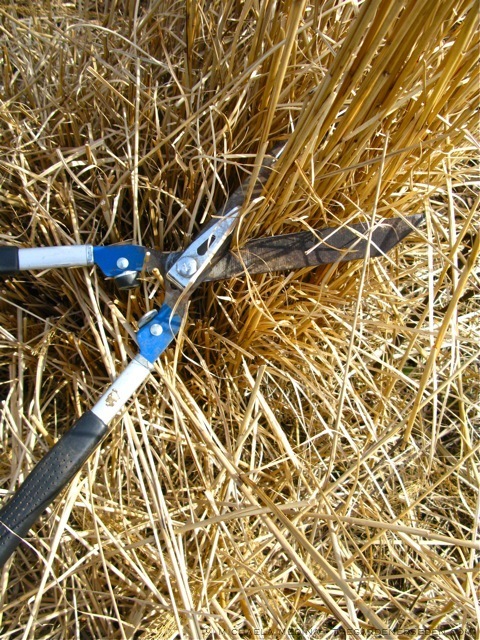 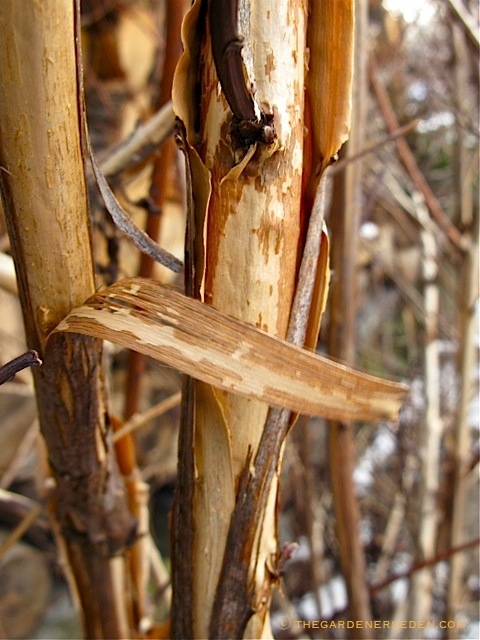 Remember to use sharp pruning shears and make clean cuts at a slight angle (clean pruners with rubbing alcohol after use to prevent spread of disease), as you would on ornamental shrubs in your own garden. 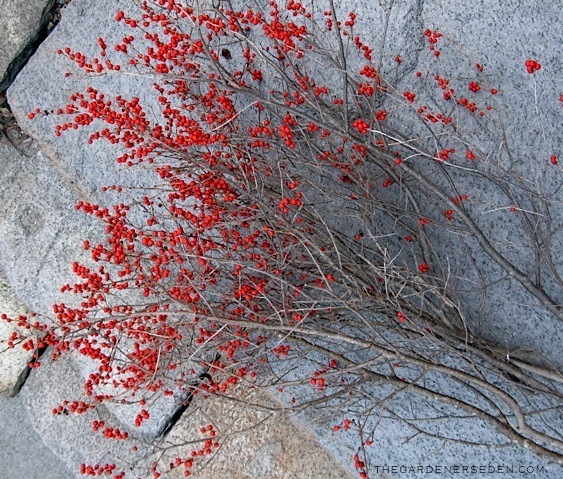 Because I have a large garden of my own, I grow enough winterberry to both enjoy in holiday decorations and in the landscape, where I can share with local birds. 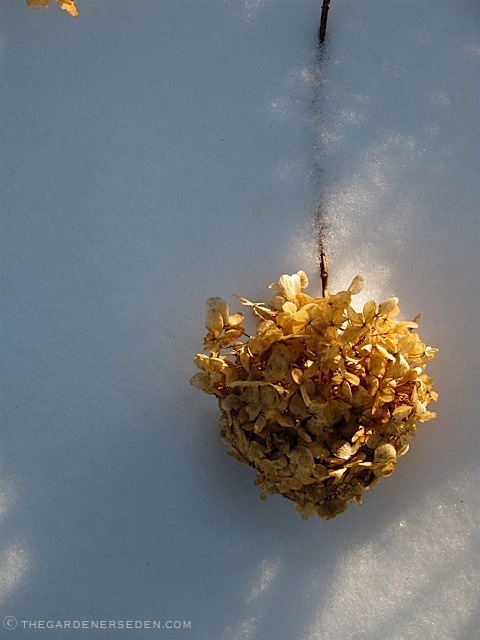 And when January rolls ’round, I deposit my discarded, decorative branches in the snow for field mice and feathered friends. 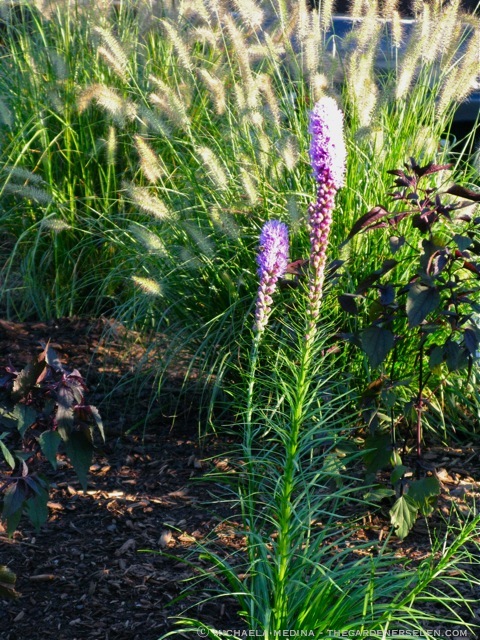 One of my favorite native plant cultivars, Physocarpus opufolius ‘Diablo’, (as well as cultivars ‘Center Glow’ and ‘Summer Wine’) is just such an endlessly versatile plant. 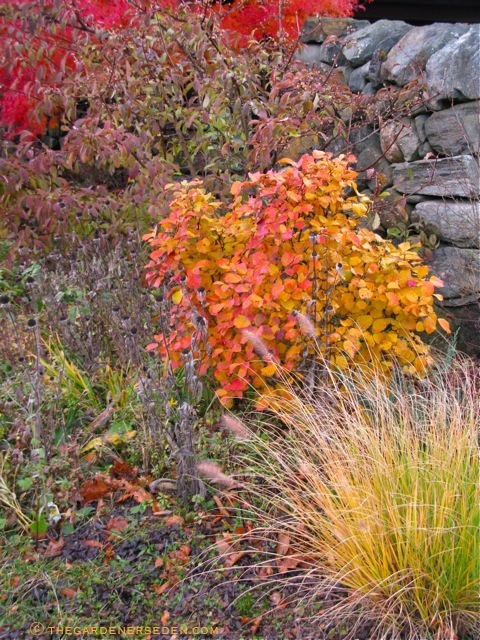 Stunning as a single specimen within a mixed border, I like to take the drama up a notch in larger gardens, combining this burgundy-leafed shrub in groups of three or more to form a dark and mysterious backdrop for other plants (particularly gold and chartreuse-leaved specimens, as well as those with variegated foliage). 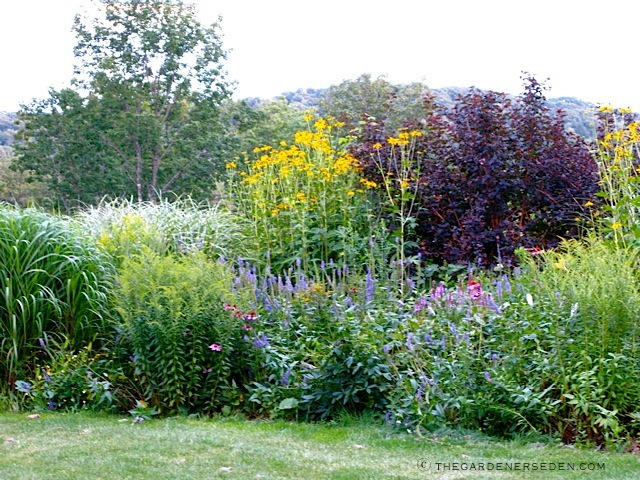 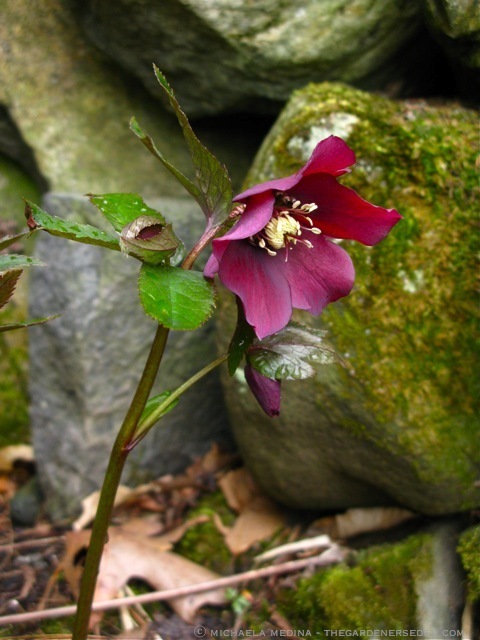 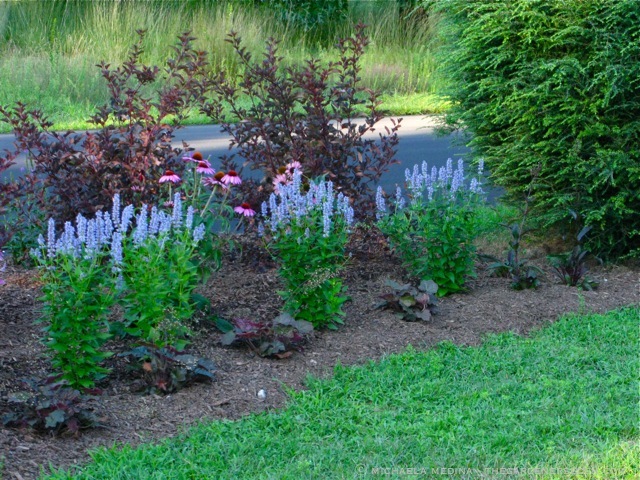 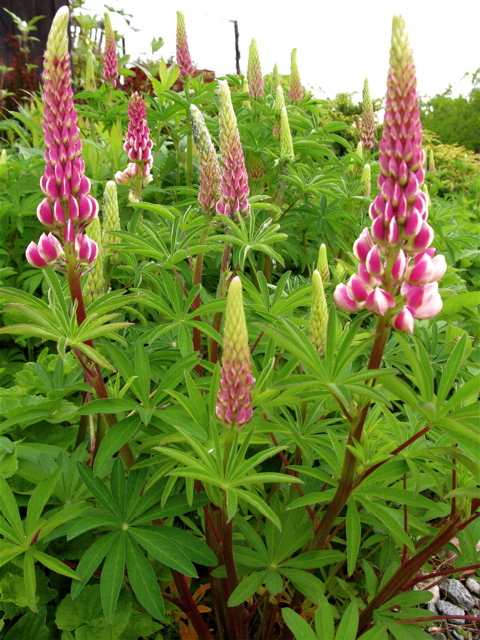 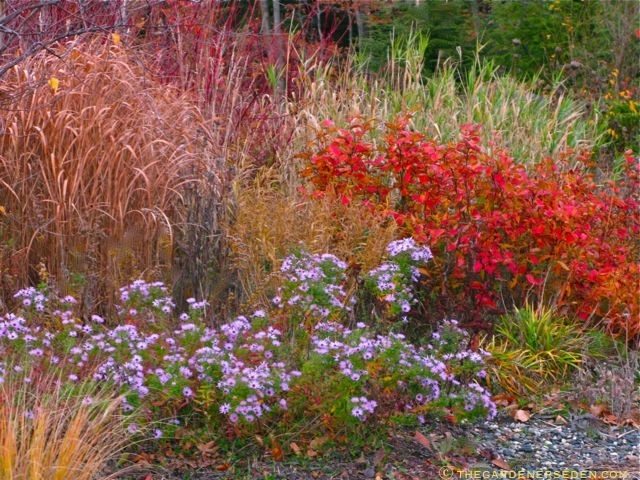 Perennials in shades of blue, violet, gold, magenta —as well as many other bold and subtle colors— stand out against the intense, maroon-leafed ‘Diablo’. 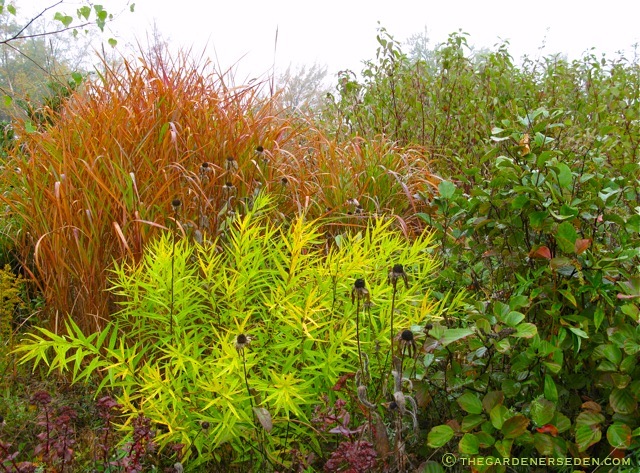 One of my favorite, striking garden combinations plays the nearly black color of Physocarpus opufolius ‘Diablo’ against the feathery, chartreuse leaves of Sambucus racemosa ‘Sutherland Gold‘ (Golden elderberry). 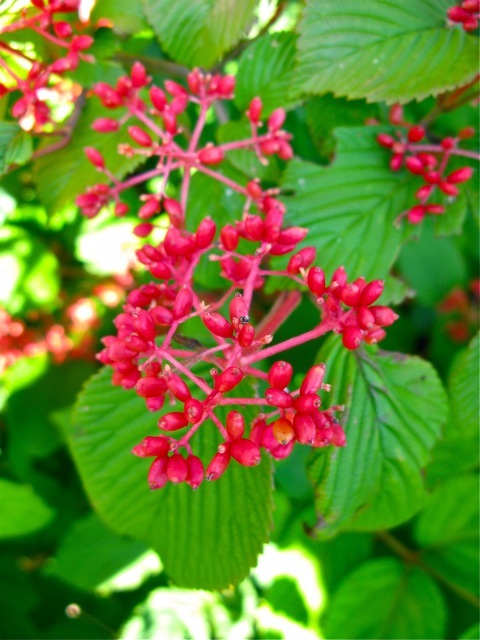 Physocarpus opulifolius (also known as common ninebark) is an extremely hardy shrub (USDA zones 2-8) native to North America. 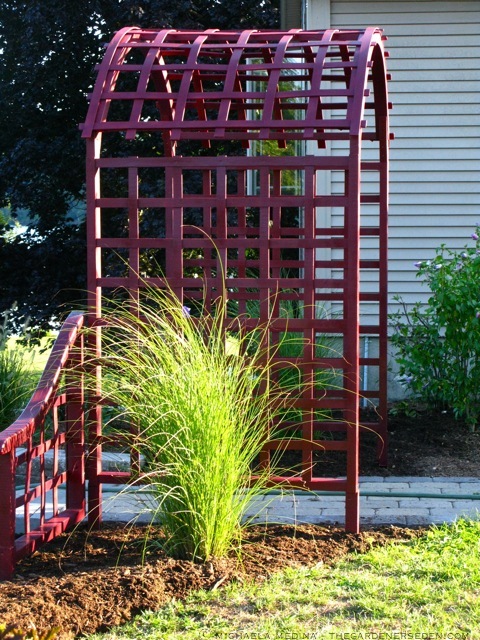 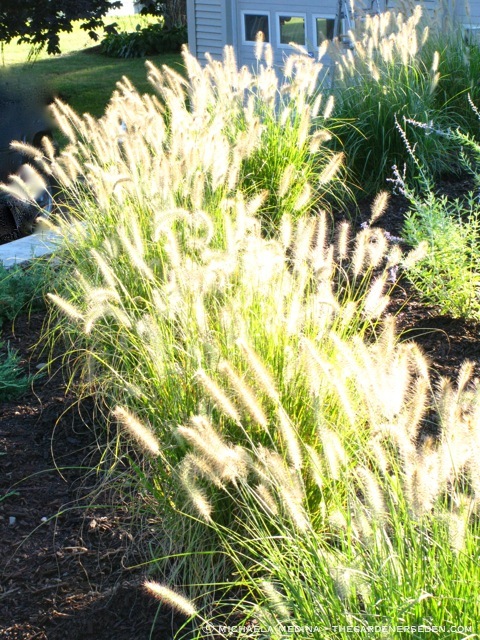 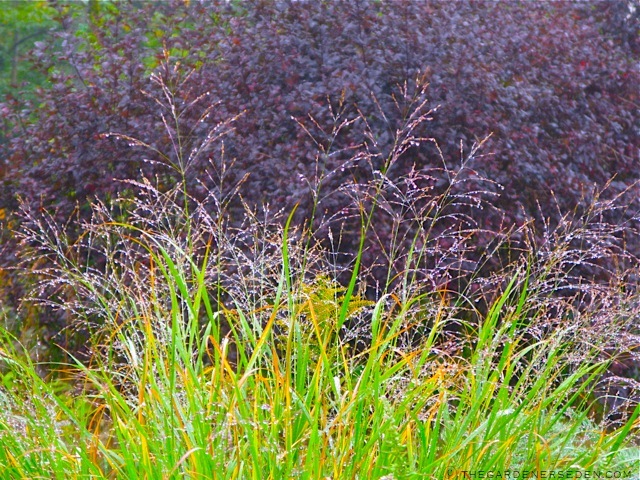 The dark, burgundy-leafed cultivar ‘Diablo’ (sometimes listed as ‘Monlo’ or ‘Diabolo’) will reach a height of 6-10 feet, with a similar spread. 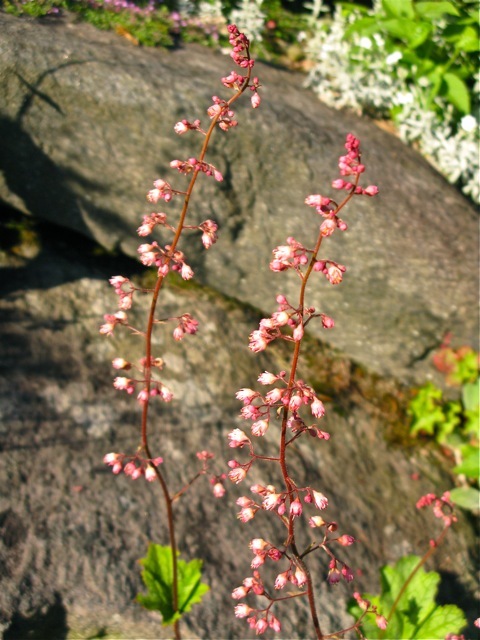 Physocarpus opulifolius presents a graceful, upright-vase shape in the garden, with softly arching branches. 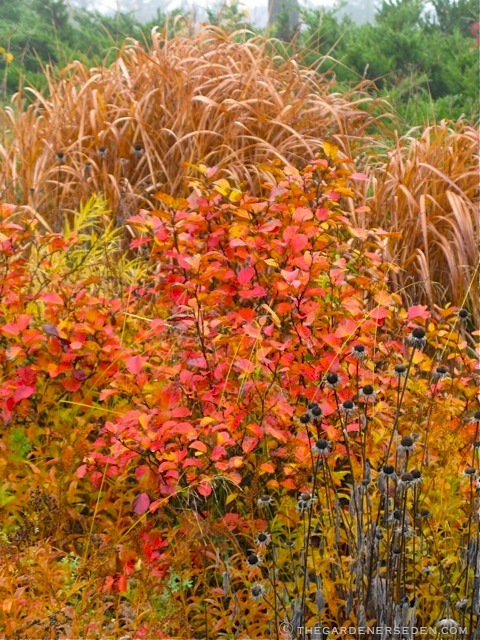 Adaptable to many garden situations, ‘Diablo’ offers dramatically dark foliage throughout the growing season, burnished shades of rust to bronze in autumn, and textural, peeling bark in winter. 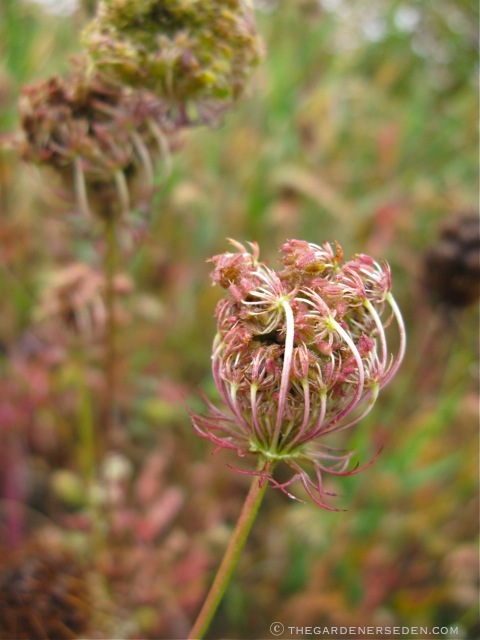 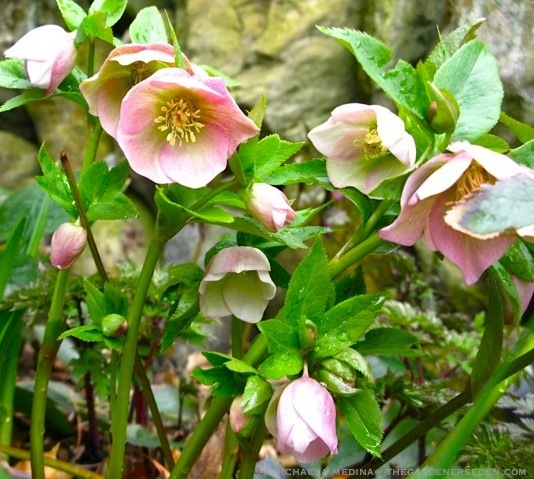 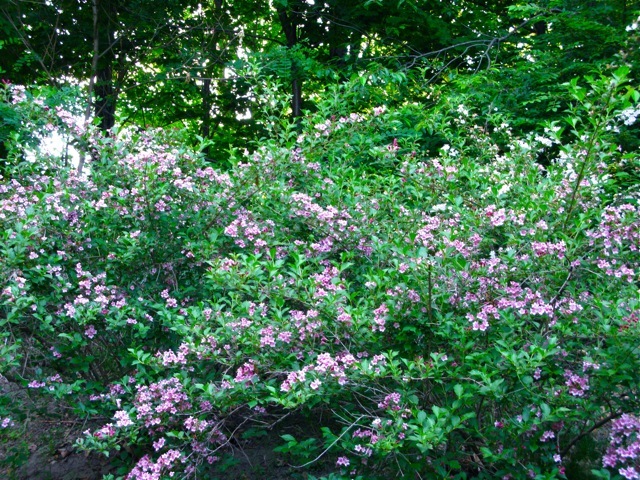 The pinkish white blossoms appear in late spring, and are a favorite, natural food source for honeybees and butterflies. 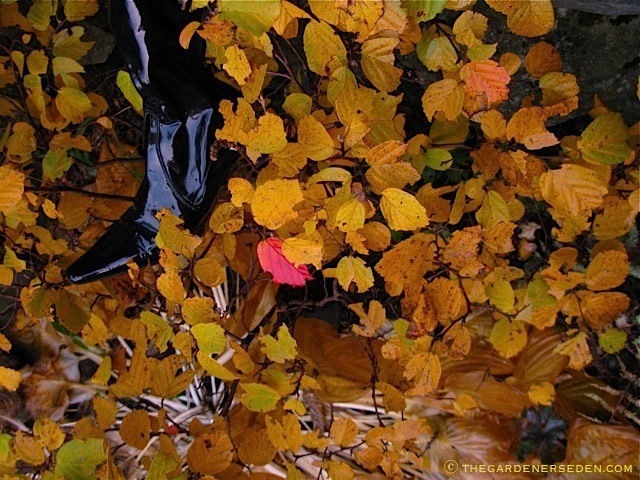 Later in the season, as the tiny red fruits ripen —strangely beautiful against the dark foliage— common ninebark becomes a living feeding station for birds and small mammals. 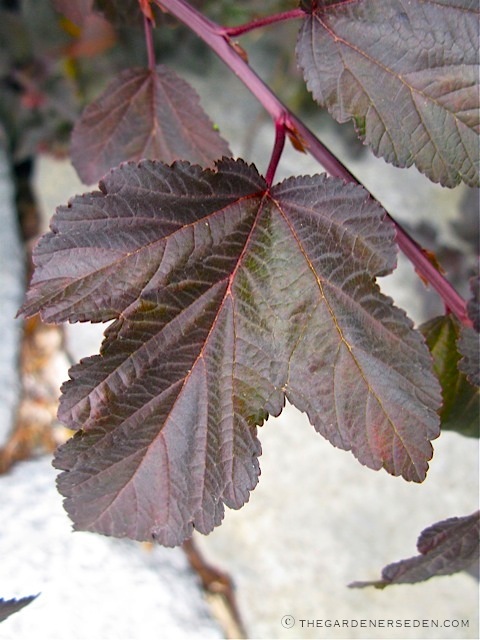 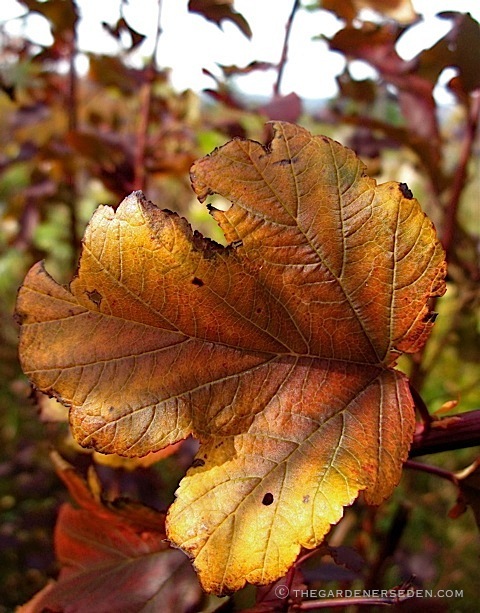 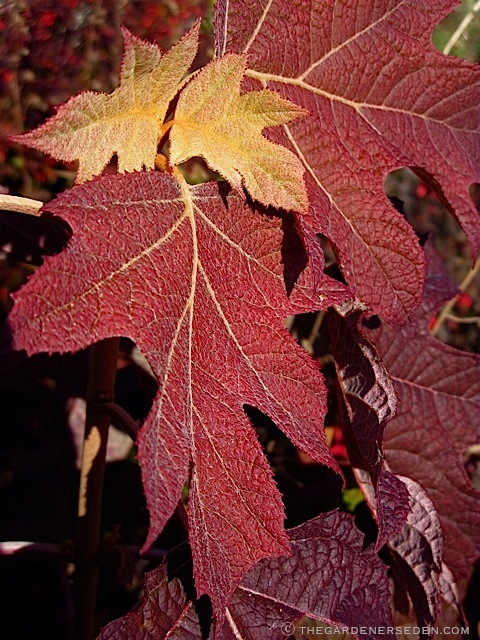 Physocarpus prefers even moisture and neutral, well-drained soil. 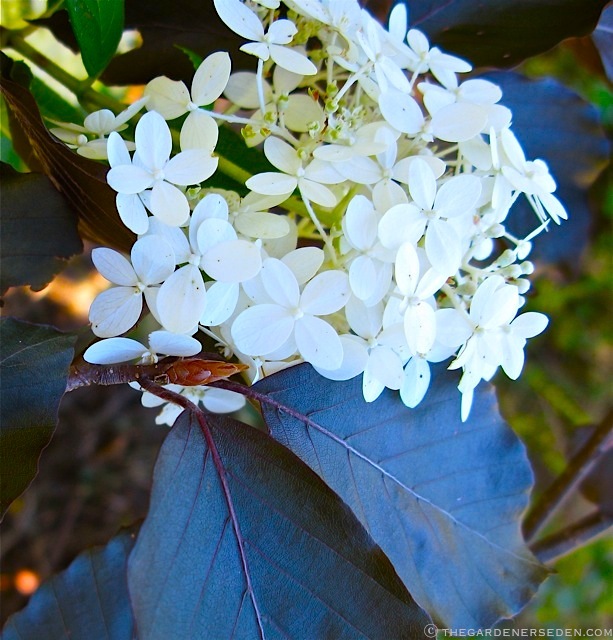 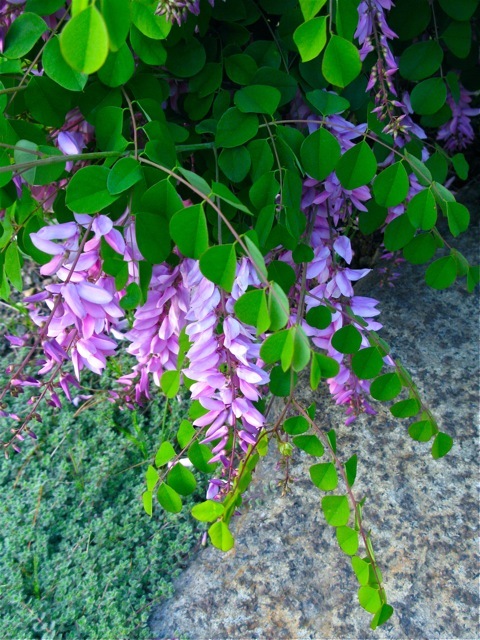 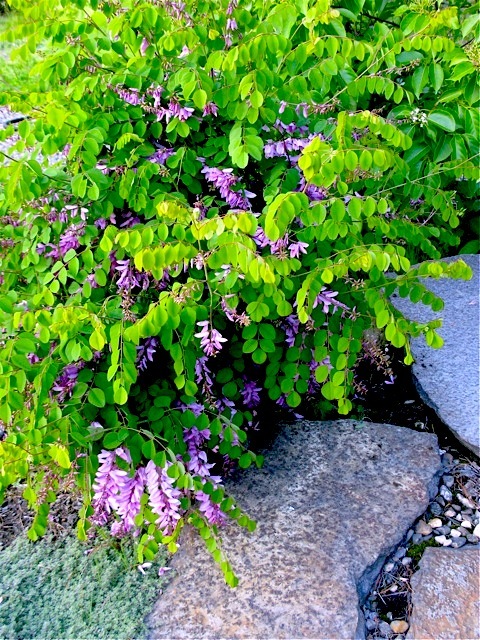 This native cultivar is an easy to please, disease and pest resistant plant suitable for sun to partial shade (if worms/caterpillars become a problem in late spring, defoliating branches, treat the leaves with OMRI approved Btk only as necessary). 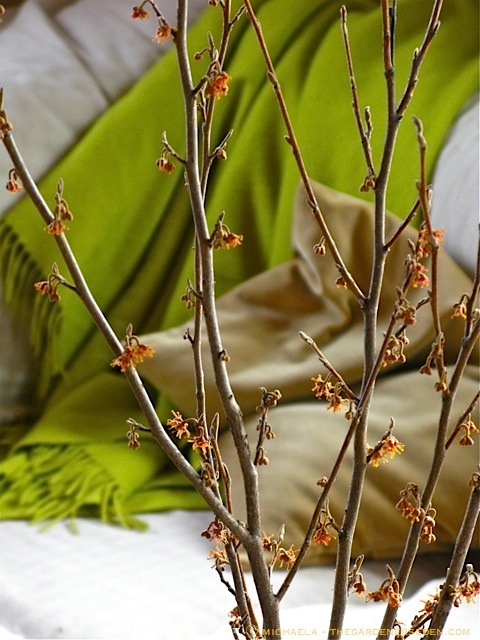 In addition to its striking presence in the garden, Physocarpus opulifolius ‘Diablo’s’ leaves and branches add sophisticated beauty to floral arrangements. 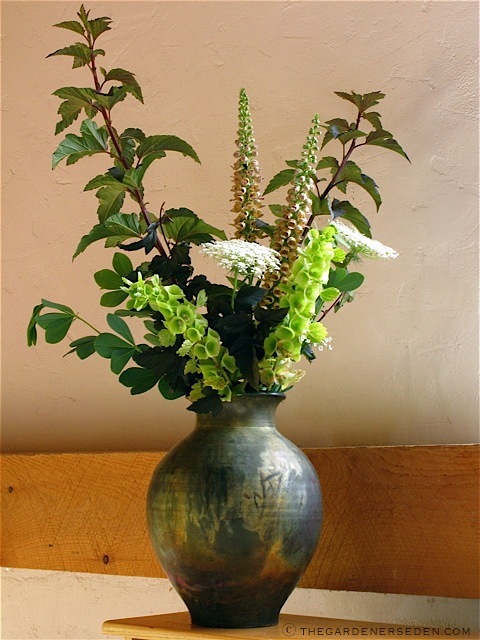 When combined with citrus-colored flowers —such as the Bells of Ireland shown below in a vase by raku artist Richard Foye— ‘Diablo’ is a real knock-out. 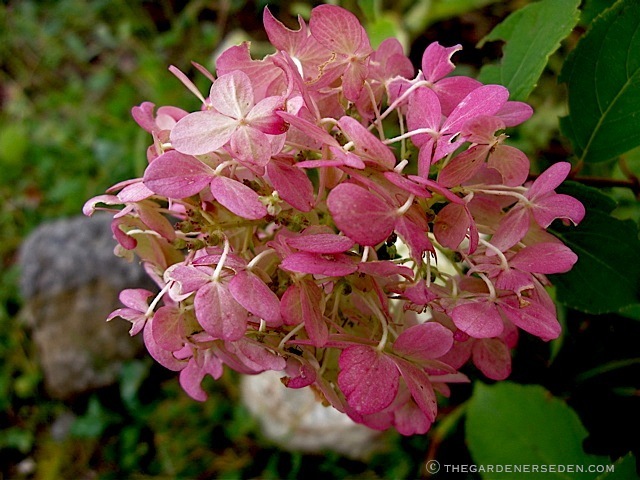 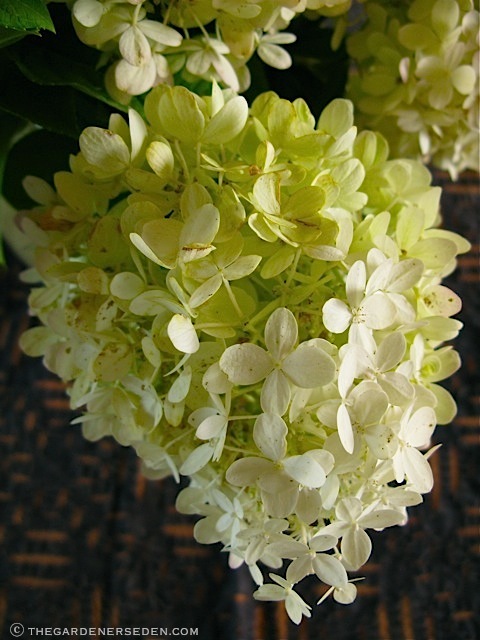 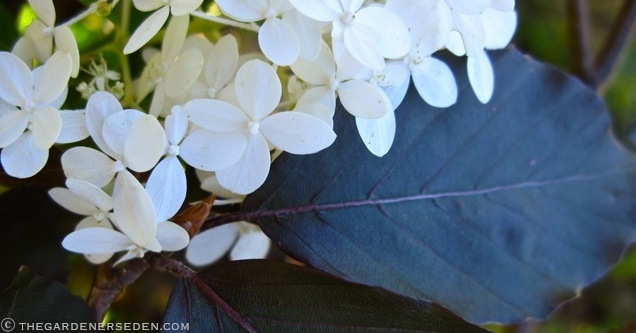 The sturdy stems also offer excellent support for more delicate flora, and a lovely vertical compliment to blowzy hydrangea blossoms — Hydrangea paniculata ‘Limelight’ is especially lovely with the maroon leaves of ‘Diablo’. 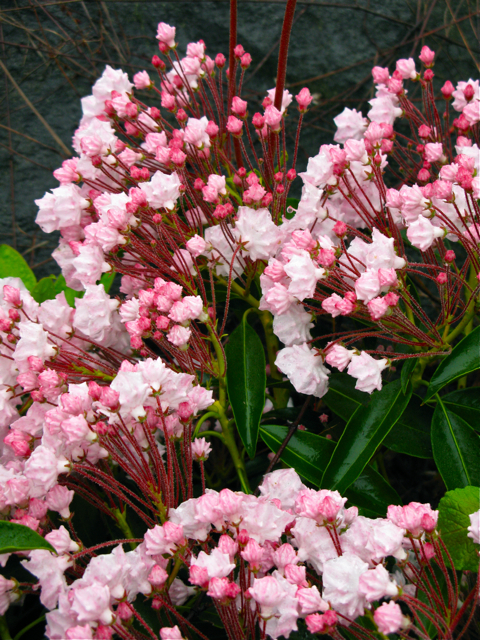 Graceful, elegant and generous are but a few of the words that spring to mind when describing Doublefile Viburnum, (V. plicatum var. 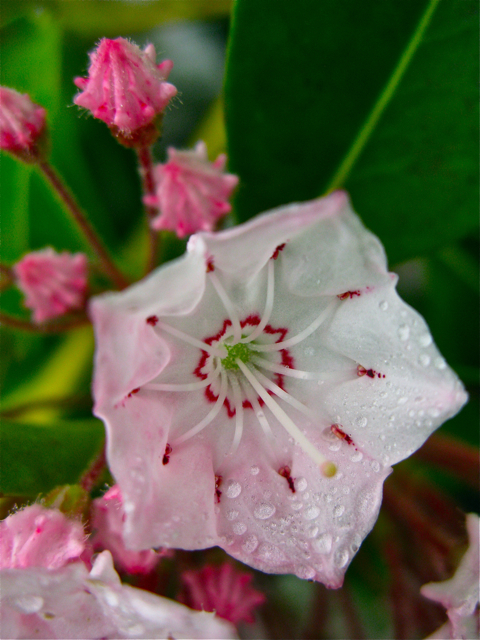 tomentosum); one of the most delightful species in my absolute favorite genus of woody plants. 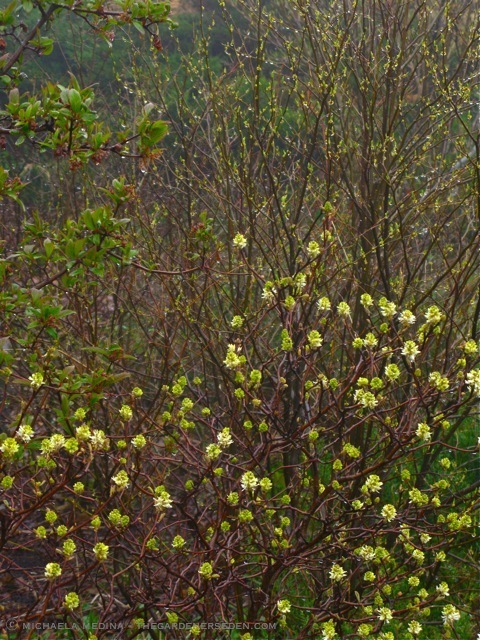 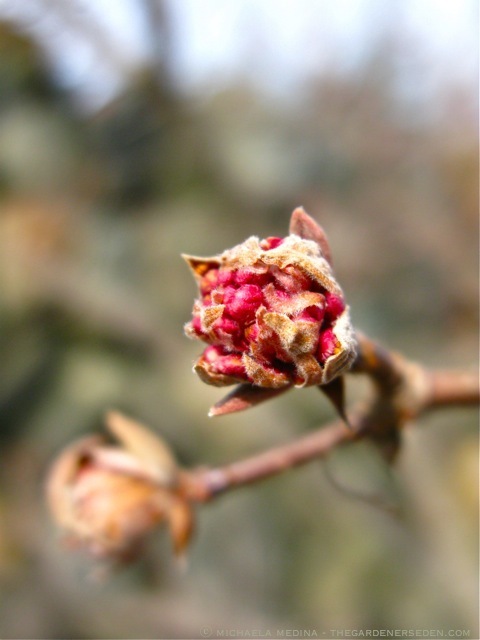 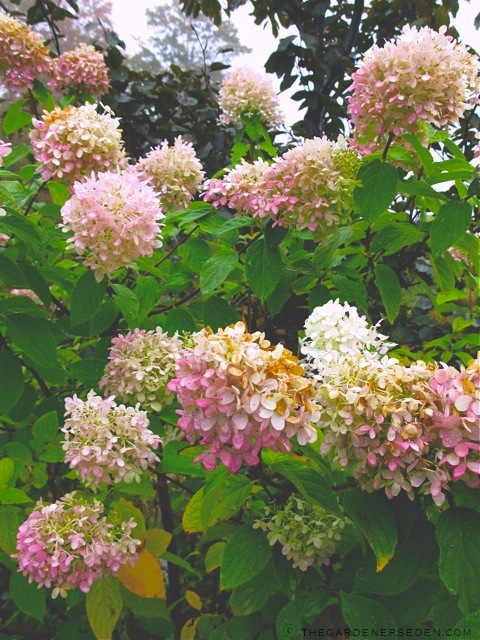 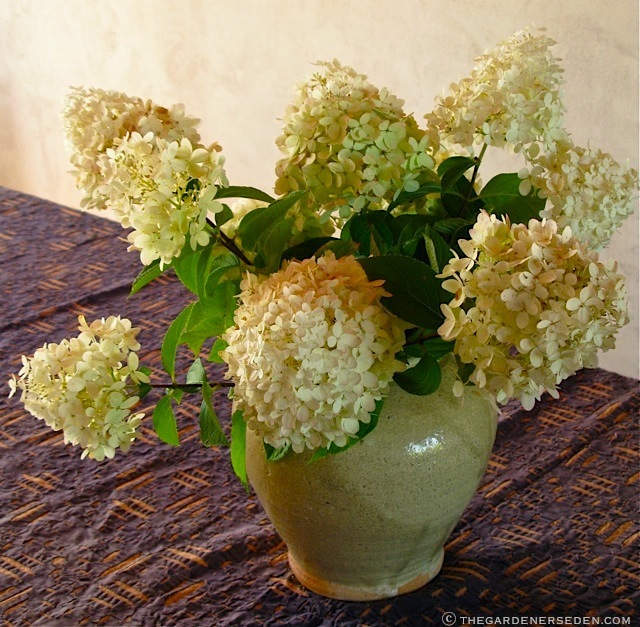 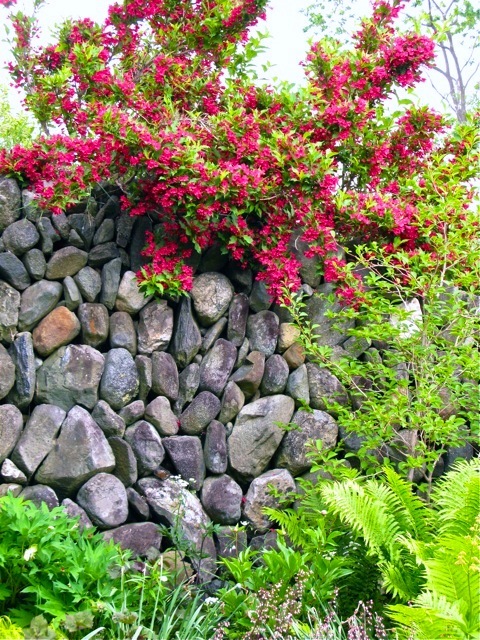 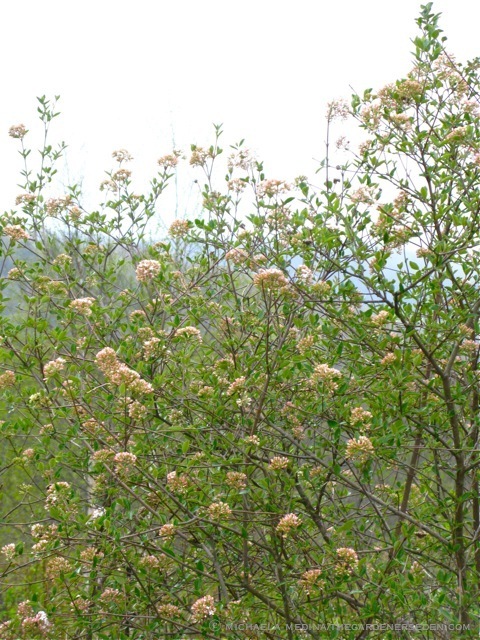 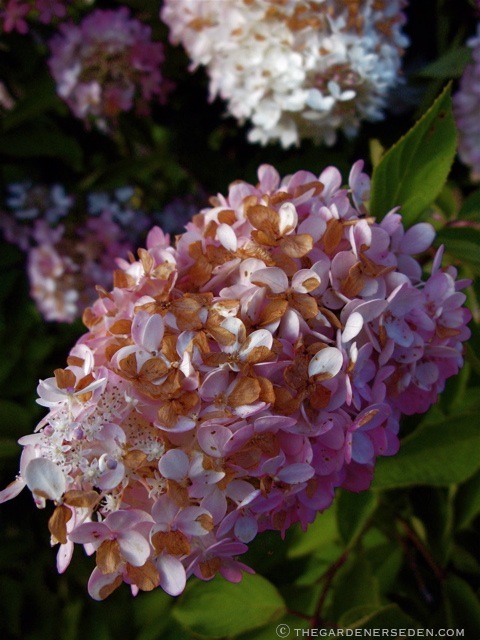 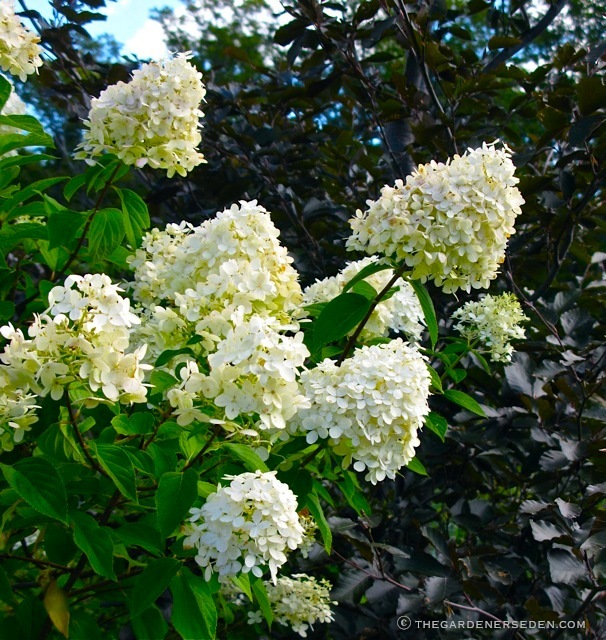 Although this shrub wears no perfume in springtime, she more than makes up for her lack of fragrance with four-season beauty and an easy-to-please manner (this species shows greater resistance to the viburnum beetle than other members of the genus, but prefers evenly moist, woodsy soil – it blooms equally well in full sun to partial shade). 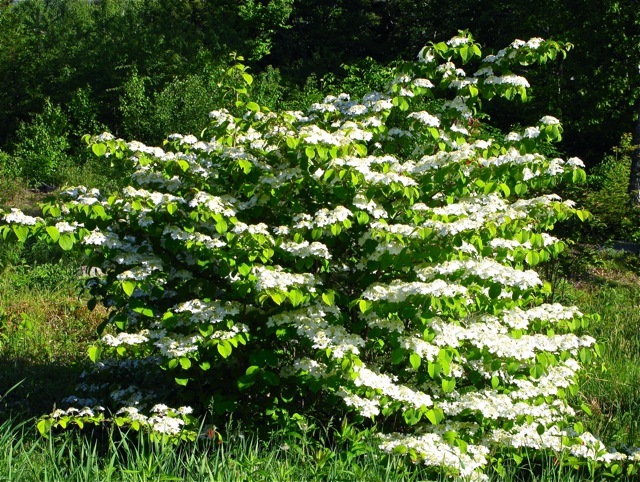 Doublefile Viburnum’s tiered, horizontally branching form reminds me a bit of another Asian native, the lovely Korean dogwood (Cornus kousa). 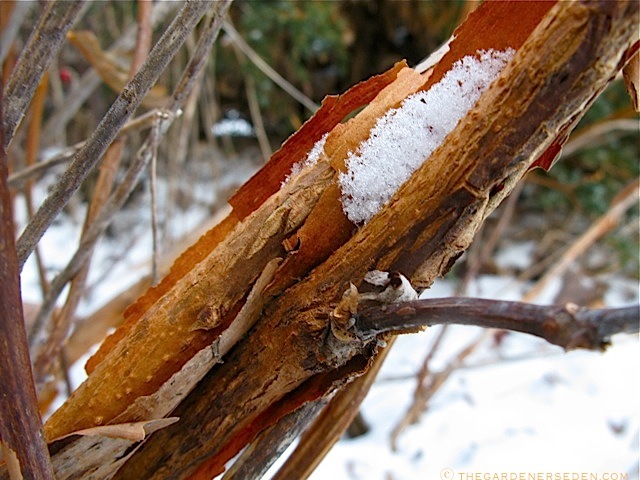 The shape of this woody plant is truly stunning —especially in winter— and it can be used to great effect when positioned to soften the edge of a building. 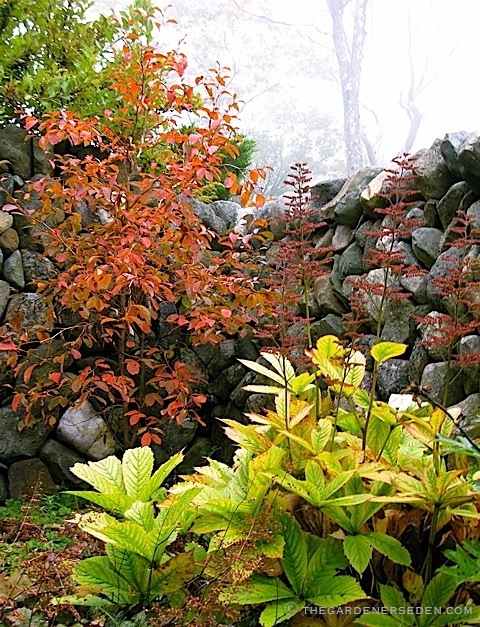 Triangulated in groups of three or more, Doublefile Viburnum creates a sophisticated, yet natural-looking screen; the dense, twiggy framework concealing eyesores almost as well as a conifer hedge. 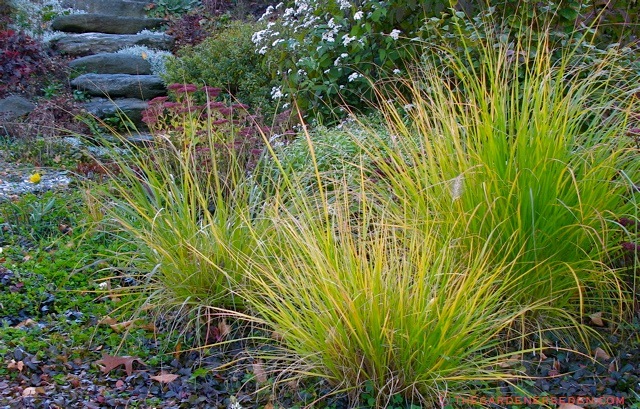 My favorite large-sized cultivars, V. plicatum var. 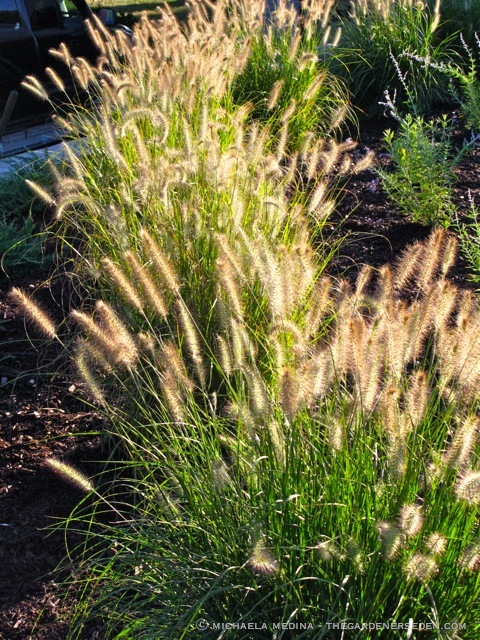 tomentosum ‘Shasta’ and ‘Mariesii’ (10′ x 12′), and the compact ‘Newport’ (3-4′ x 4-5′) —all hardy in USDA zones 4/5-9— fill the garden with a constellation of starry, white blossoms from mid May to late June. 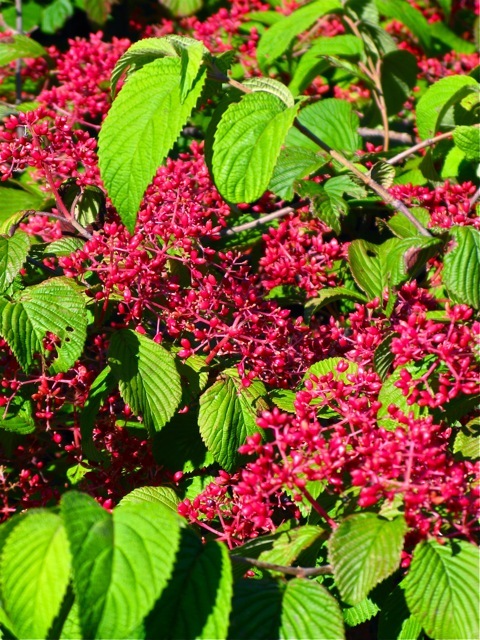 A magnet for bees and butterflies in spring and early summer, during the summer months of July and August the large Doublefile Viburnums are loaded with bright red berries, which attract cedar waxwings, sparrows, mockingbirds, thrushes and a wide variety of other songbirds to the garden (compact cultivar ‘Newport’ can be a bit stingy with fruit production). 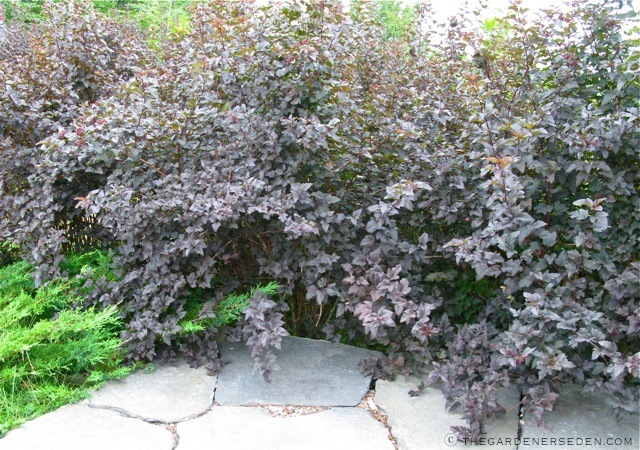 Although the fruits eventually mature to black in late August, the shrubs on my property are usually picked clean long before the berries deepen to black. 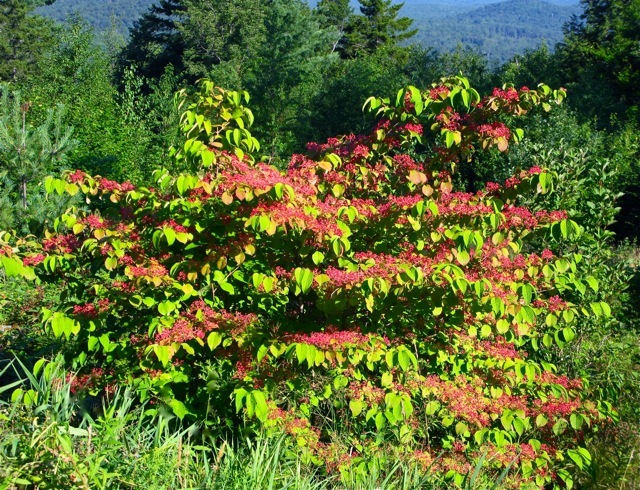 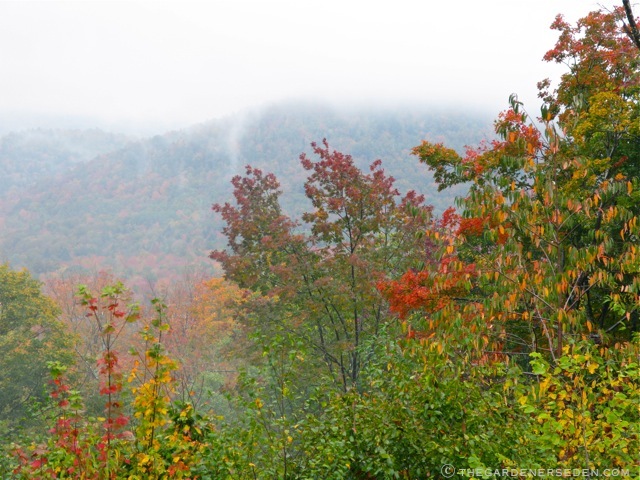 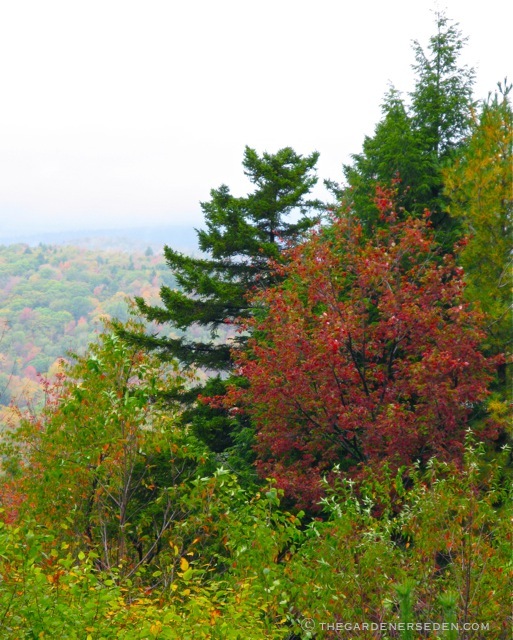 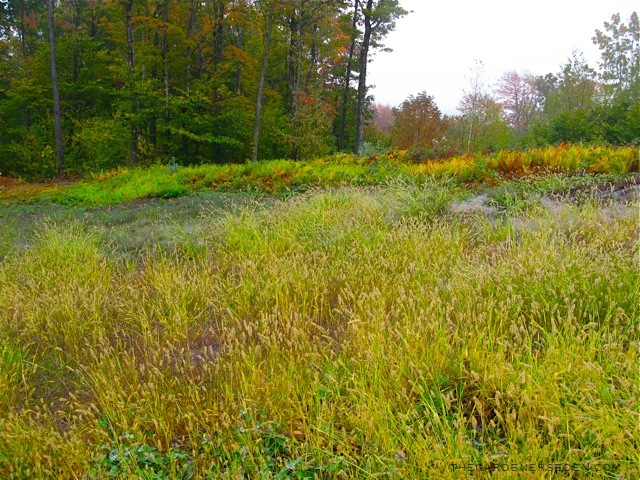 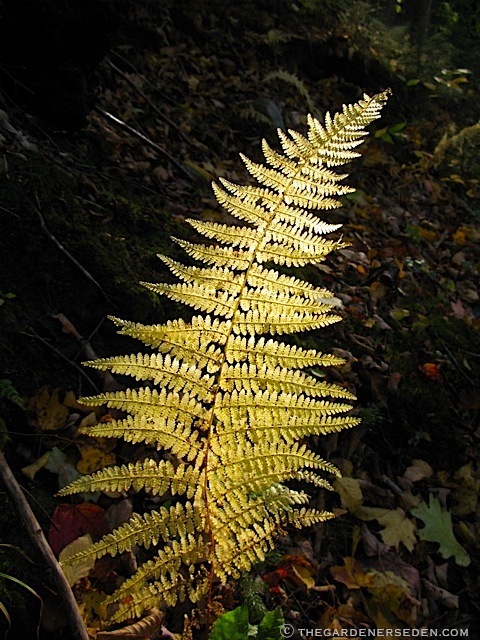 Later in the season, as days shorten and temperatures cool, the foliage of this species begins to subtly shift. 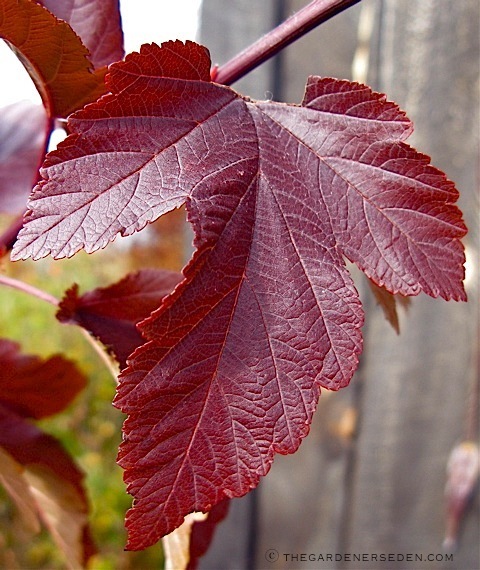 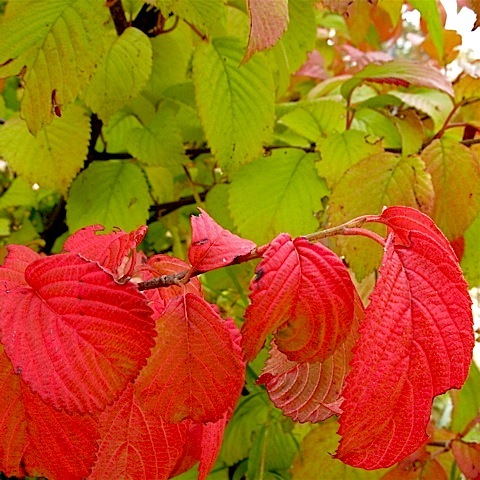 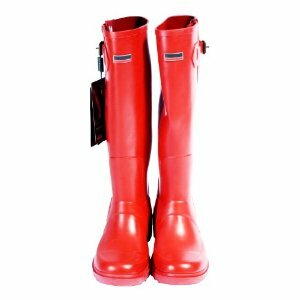 First lightening to chartreuse and cherry, then deepening to burgundy red, and eventually burnishing to a fine shade of oxblood, Doublefile Viburnum puts on a fine fashion show before shedding her cloak for winter…. 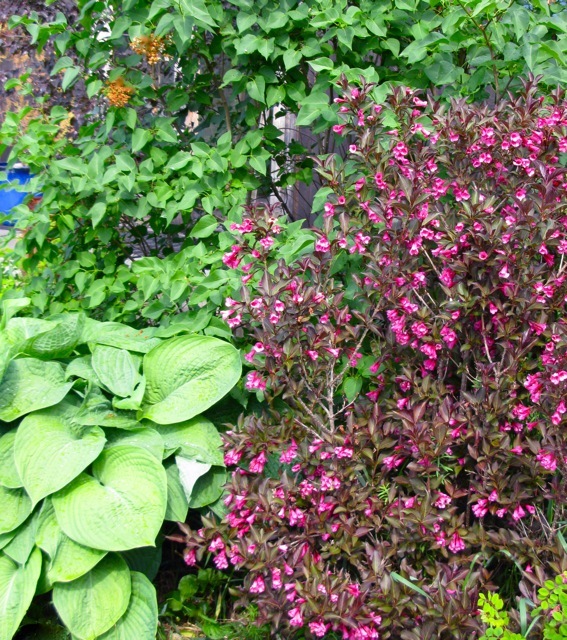 To look at the voluminous cascade of crimson blossoms spilling over my Secret Garden wall this week, you’d never guess that this Red Prince (Weigela florida) is positioned in the toughest, most exposed corner of my blustery, ledgy site. 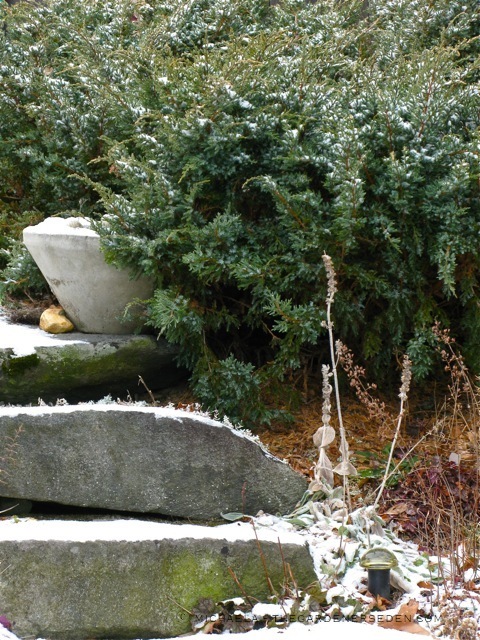 Bearing the full force of the northwest wind as it blasts across the ridge straight from the Green Mountains, I fully expected my Weigela to perish in its first winter. 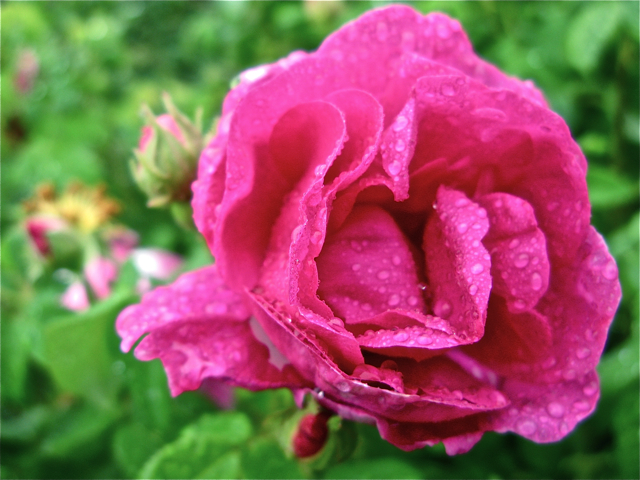 Five years later, in spite of sub-zero temperatures, snow drifts, thick sheets of ice, and the doubts of a rather pessimistic mistress, the prince of my garden is once again greeting June cloaked in the most glorious red robe I have ever seen. 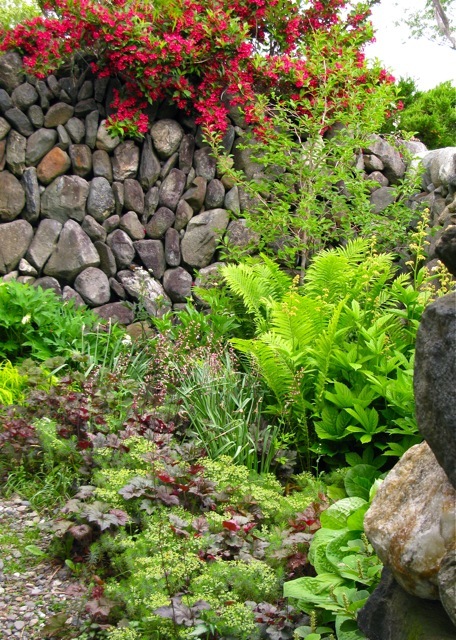 As you can see, there he sits; sprawled out in the sun, high atop the Secret Garden wall, where his funnel-shaped flowers attract legions of hummingbirds, bees, butterflies, and countless sighs. 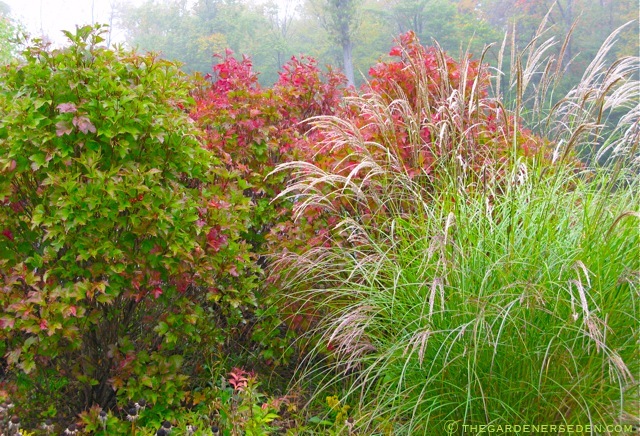 You are currently browsing the Hardy shrubs category at The Gardener's Eden.